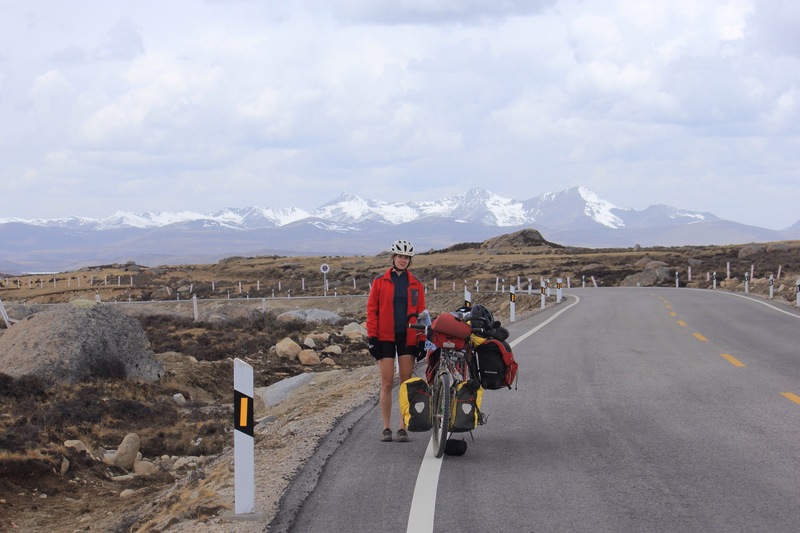 After our nice rest day in Dege we continue on our northern loop journey (part 1 here) – from here on, the adventure would really start. 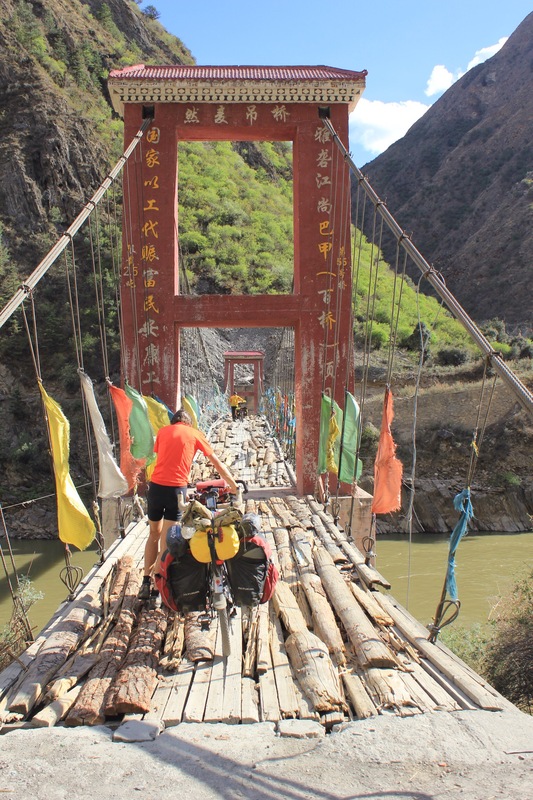 The first day from Dege, heading towards Hepo, would be easy, we knew it was paved and we would be following the famous Yangtze River (again!) downstream so no big surprise hills to climb. Most excitingly we would spend most of the day being a stones throw away from Tibet who’s borders start on the other side of the river. 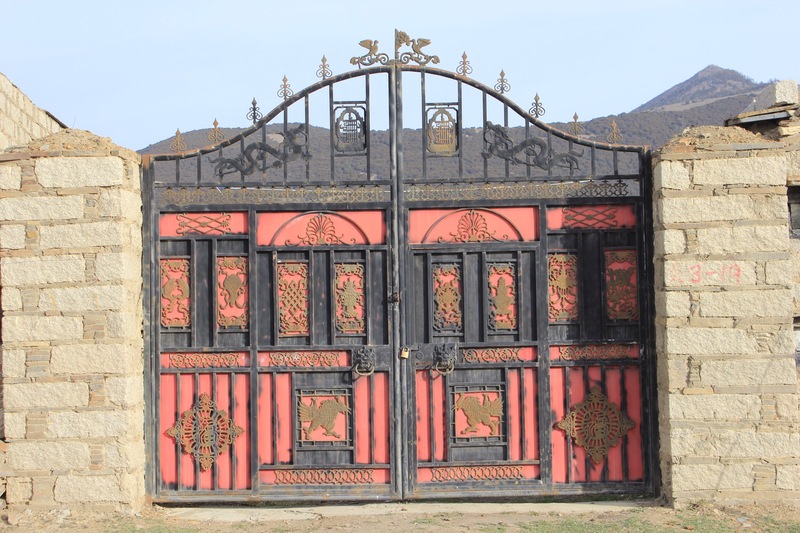 All major roads and bridges to Tibet are still heavily guarded with checkpoints. Chinese tourists are able to travel freely in the region – after all, it is technically part of China 😦 – but foreign travellers require a permit and to be accompanied by a registered guide 24/7. 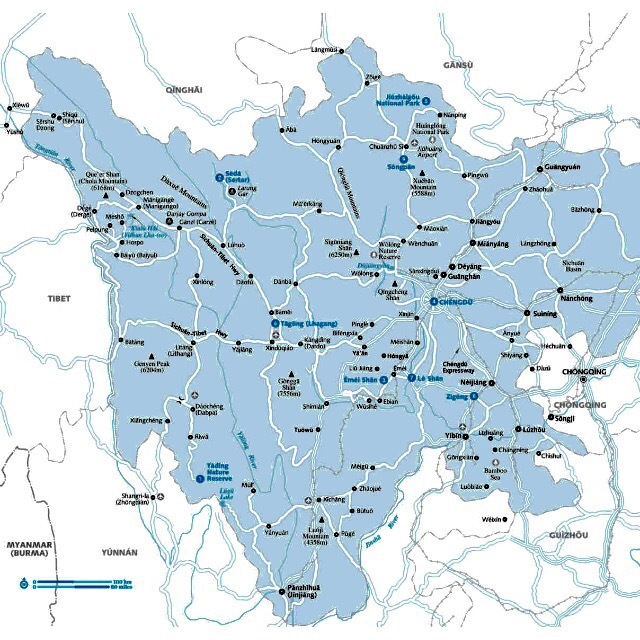 We very much hoped we’d find a way to sneak across along the way though, it would be nice to symbolically set foot in the region, even if it was just for 5 minutes. So we head off and it’s a nice cycle with a lovely paved road. 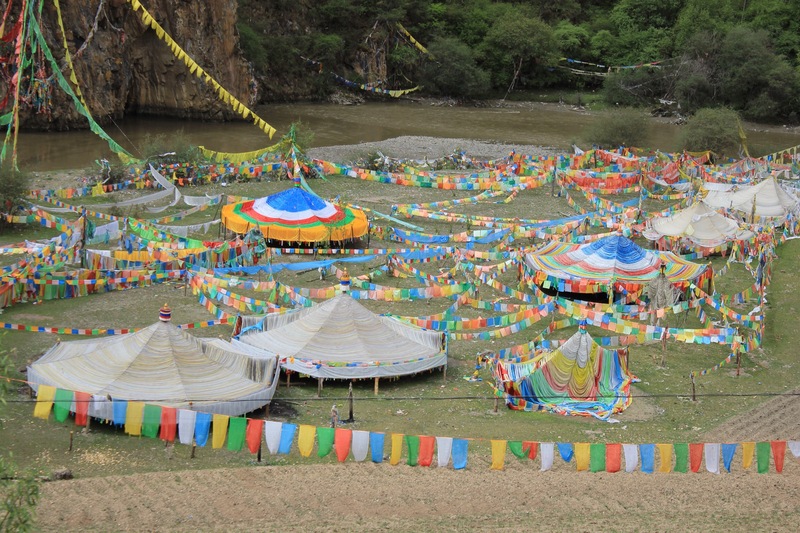 We pass a monastery on a hill and down below next to the river are these big tents. 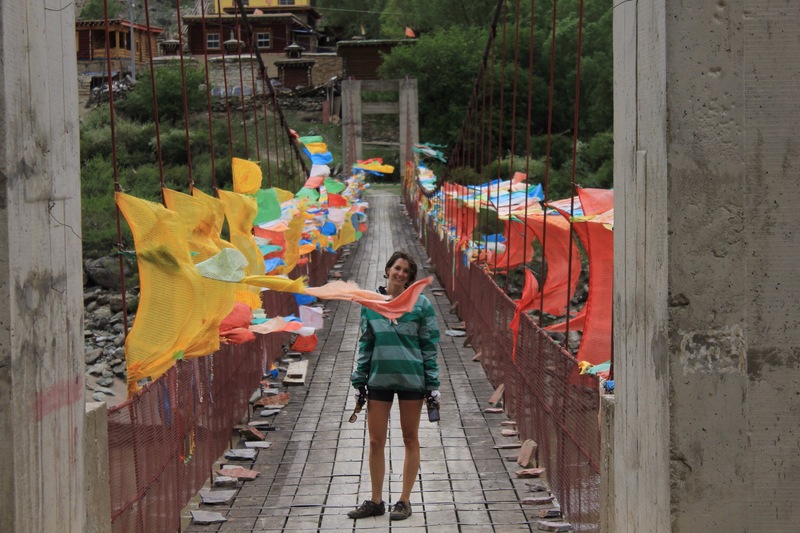 A very strong tailwind helps us along and we make good headway and finally we see a footbridge adorned with prayer flags stretching over the river towards a thin track leading away from the shoreline. 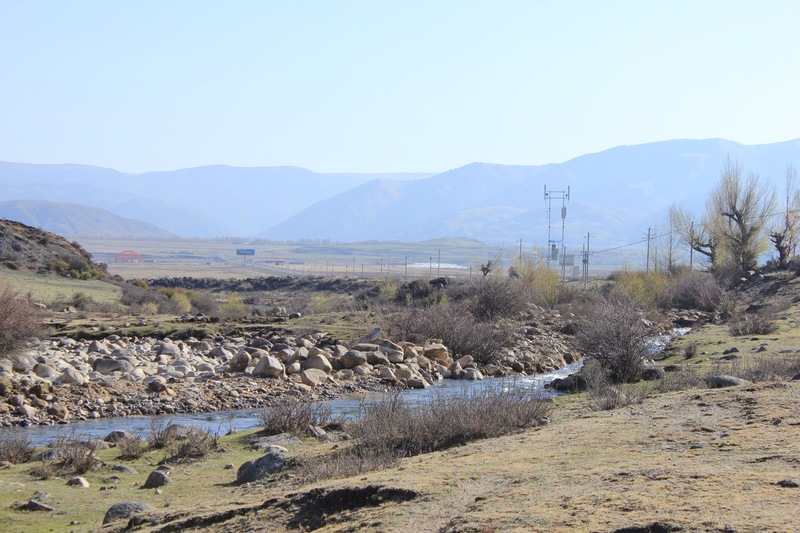 No checkpoint and no Chinese security in sight! 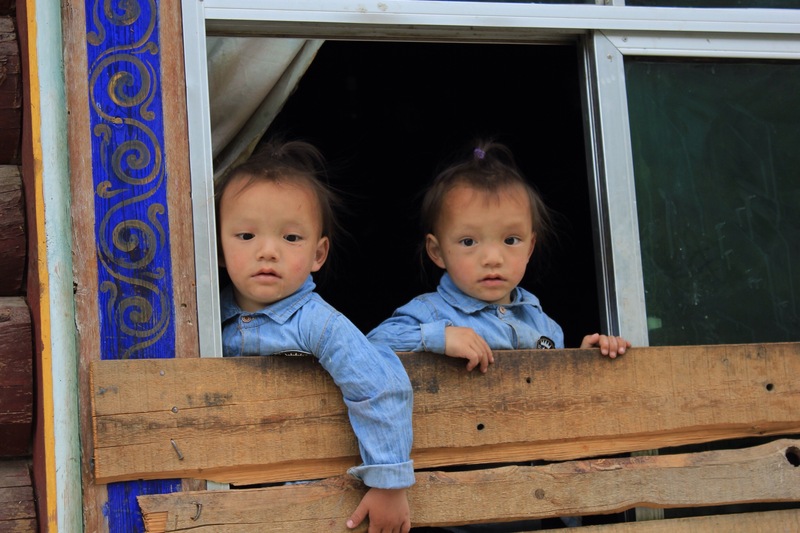 These angelic twins peaked theirs heads out of a window to watch us cross. After the excitement of reaching Tibet we stop for our standard noodle and veg lunch and a yak fight breaks out in front of us. It’s not as ferocious as we hope, ending after only a few minor head bumps. As we approach Hepo it really starts to rain heavily but we manage to find a small restaurant and shop where we stop for a nice bowl of noodles. During a restbite in the showers we set up camp on a public grassy park like section just outside the town. We get an early night due to the rain. We wake to a glorious morning and set off up the same dirt road through a gorgeous valley. Today we hope to get to a village called Dalang Duo which is where the road ends on our OSM map. Wild flowers of every colour line the banks and up the valley we can see trees covered in blossom, their branches almost sagging under the weight of white, pink and yellow flowers. 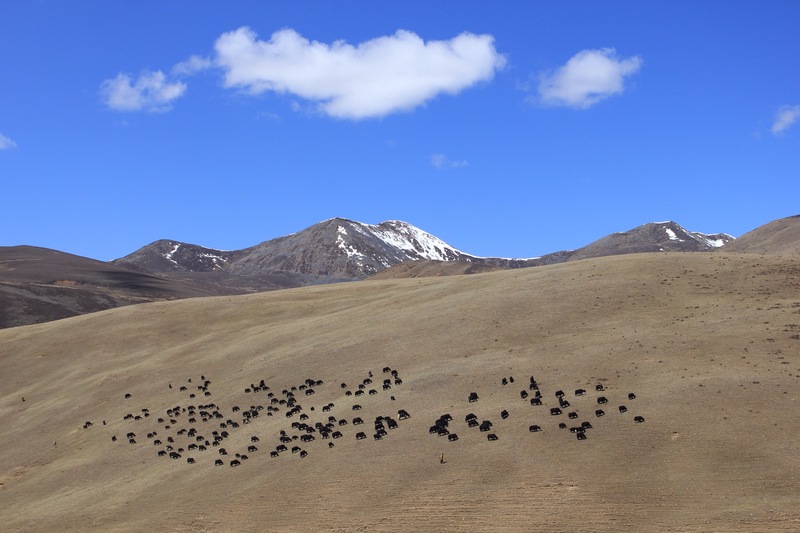 Shaggy horses and long haired yaks keep us company as we wind our way up. 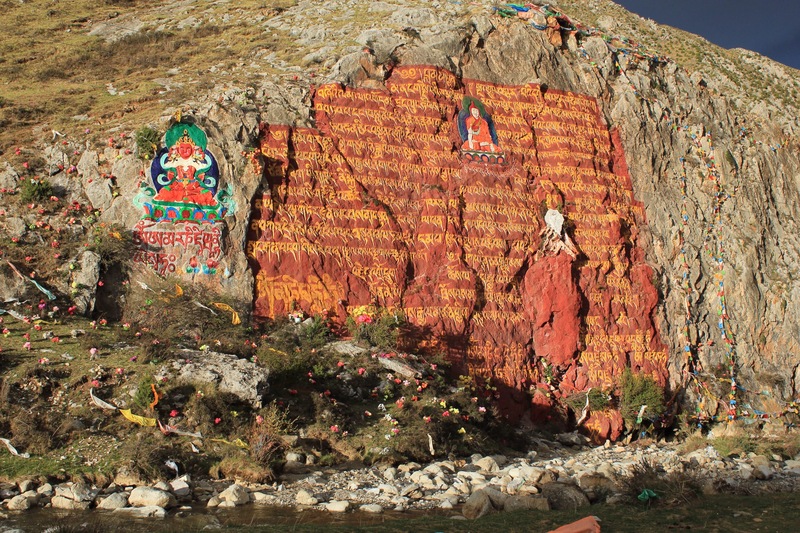 We’re getting more and more remote as we climb and the white plastered chortens we have got accustomed to seeing turn into simpler stone and compact earth structures. We fill up our water bottles from mountain streams and stop for lunch in a great gorge. 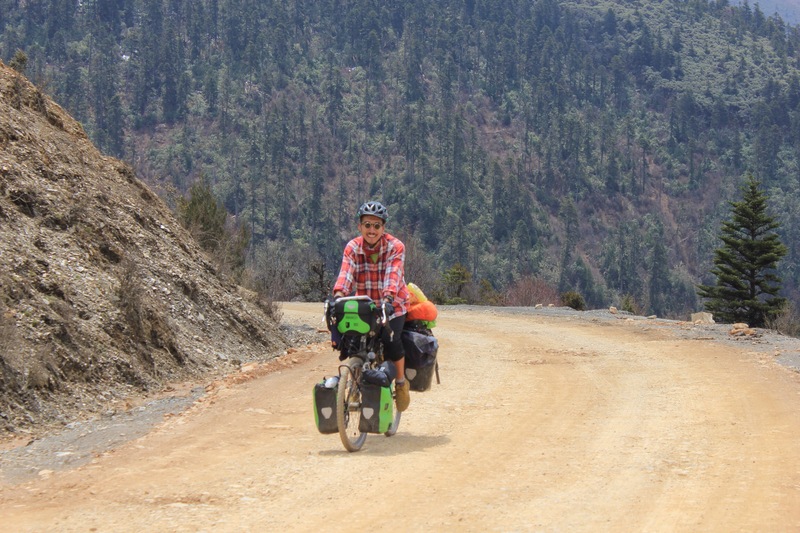 The road narrows and gets bumpier… We climb up the final valley but some of the road is too uneven and steep to cycle so we have to get off and push the tandem instead. On one such climb the bike slips and Paddy ends up face down in the road. He’s covered in red dust but otherwise unhurt and we push the bike up the hill. We reach the village called Dalang Duo which is the final marked point on our OSM map. Here the road stops completely and there is only a small path onwards to the next village. A bunch of men were laying a cement road just outside the village and so we ask them how we get over the mountain pass to Ganzi from here. Many of them look disbelievingly at our bike then back at us and shake their heads. They point back down the dirt road we’ve just come up. 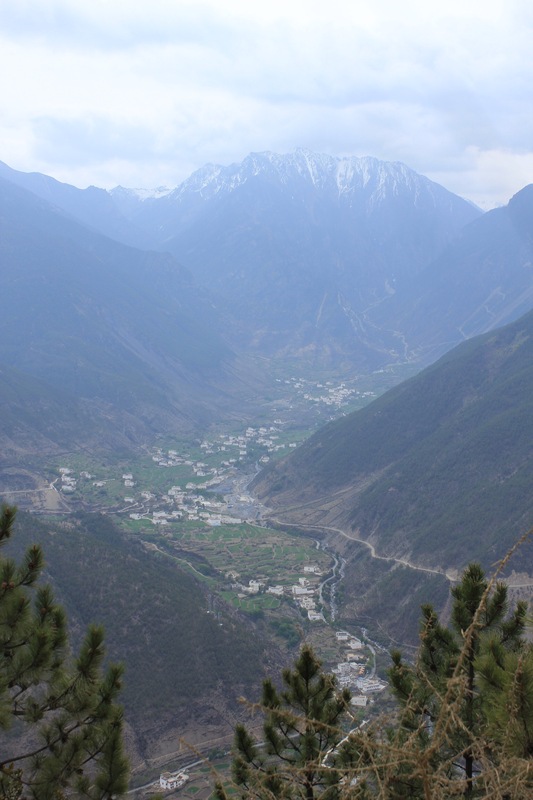 We try to explain that we are aware that there is a way through, and that we wanted to get up over the mountain and down towards where we knew there was a connecting road down to Rongpasta and back to Ganzi. In the end a friendly monk pointed to a valley which we could see cut its way up above the village and, through limited sign language and marking points on our map, he explained that it was a steep, narrow track up to the top which then descended into a valley and connected to the road we needed. It was clear from his facial expressions that it would be a difficult ride and Paddy and I came to terms with the fact that we would likely be pushing the bike a fair amount of the way. 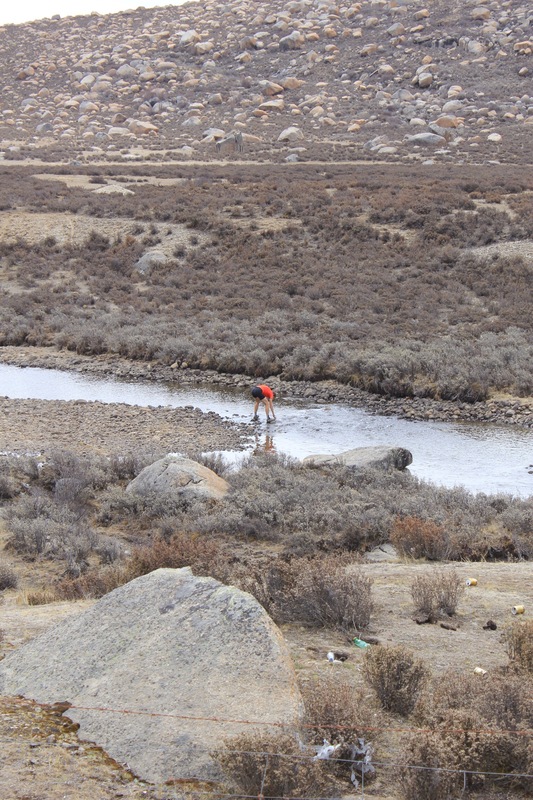 We find a great riverbank spot to pitch the tent and as its early and we have plenty of fresh water to hand, we boil enough up for us to wash the majority of the dust away. As we’re getting the tent up, a cheerful group pass by on 3 motorbikes. They have just headed down the pass we’re hoping to climb the next day. This cheers us up a lot – if they can get through so can we. They borrow our bike pump as one of them has a flat tyre and the women casually examine all our camping gear. 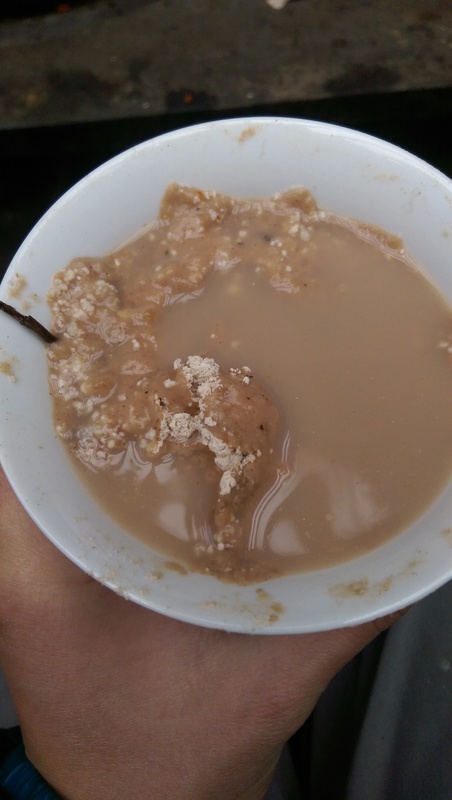 They also show us the caterpillar cocoons they’ve collected – an absolute delicacy in this part of China! We fall asleep feeling apprehensive about the next day and wondering if we’ll make it over… Im not feeling the best either and I just hope I haven’t caught anything really terrible. It’s a drizzly morning and I wake up feeling very coldy but we manage to get going early… we both knew it was wise to give ourselves as long as possible to find our way up and over the pass. This basically sums up our morning… We creep up the valley zigzagging our way around a roaring stream, half pushing and half desperately pedalling. 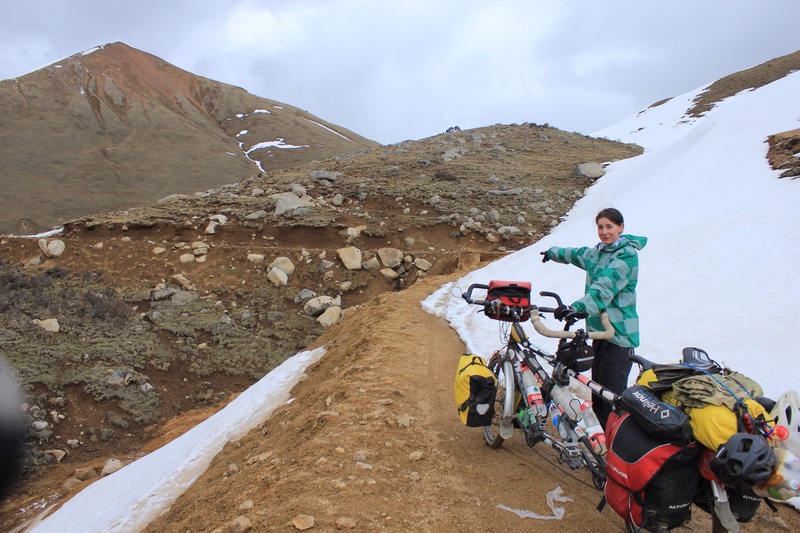 We keep going and some helpful switchbacks able us to cycle about a kilometre before we have to get off and push again. The valley opens out to a boggy plain, it starts to hail quite heavily. We stop to cook up a quick lunch and as we’re reviving slightly over a steaming mug of coffee we see the motorcyclist who had passed us earlier coming back from the top. He stops and signals that there is knee deep snow, that he can’t get through and he’s turning back to try the way round via Dege instead. Paddy and I look at each other. ‘It doesn’t sound too good, does it?’ I say to P.
We both felt better having eaten a lot and as we pack up, the hail stops and the sun breaks through. We take this as an encouraging sign that we should keep going. After another two hours of ‘cycle pushing’ we reach the summit and yes, there was snow. It must have fallen the previous night. By this point, an added challenge in the form of our footwear had developed. My shoes and socks were soaked because I had slipped while pushing the bike through a river. 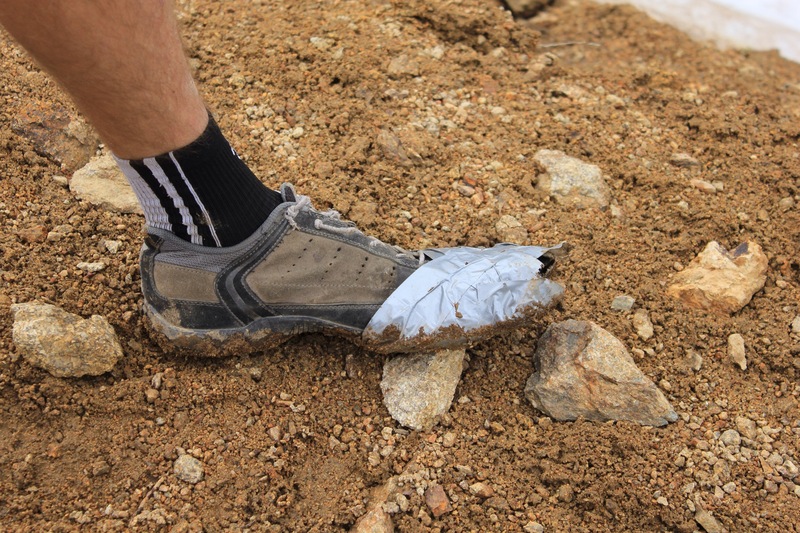 Paddy was in a sorrier state… One of his shoes had decided that now would be a good time to disintegrate and he was having to reinforce his foot with duck-tape every half an hour…. It was hard to see how much snow there was on the actual path so we pushed our way up and reached our first drift. We had got through this first hurdle without too much hassle. We turned the corner and saw the path disappeared under two foot of fresh snow. 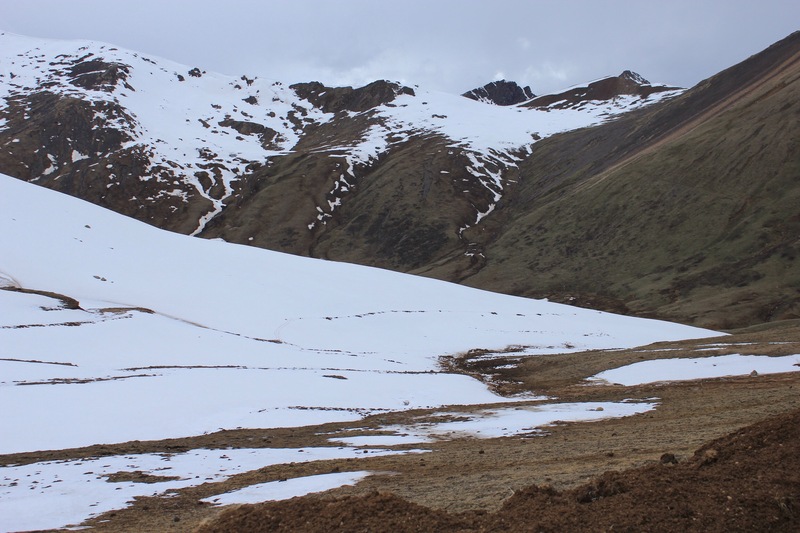 About 400m away across this smooth white carpet we could see the path snaking its way up and over the pass. It was 4pm. We had to do this, we just had to! If we got through this we’d be over and then we would have gravity on our side. Our only option was to leave the bags, take the bike across and then come back for the gear. To add insult to injury, as we unloaded the bike, our beloved stand broke. With Paddy at the front and me at the back, we half dragged, half carried the tandem through the snow which, at the deepest points, came to half way up my thigh. It held up well and we rested it on the bank while we went back for the bags. If the situation hadn’t been so crazy I might have found the whole thing funny! Anyway, we got the bike, the bags and ourselves across safely. Here is a quick snap I took of the top (photos weren’t high on the list of priorities at the time). You can just make out the faint black trail going across the right of the snow drift… That was where we pushed our way through. So we were at the top but there was another similar snow drift on the other side of the mountain. We were no longer pushing up however, and as a new snow blizzard started (no exaggeration!) we managed to drag the loaded bike through two more drifts. It was 6pm and we had done the hard part. The ‘road’ on this side of the mountain was little more than a narrow path through a boggy, muddy field. We needed to lose height fast though. Thankfully the blizzard had passed but we were betting that it would snow heavily again that night. As we squelched our way down the valley we spotted a collection of buildings in the distance. Smoke was curling its way up from a small chimney! 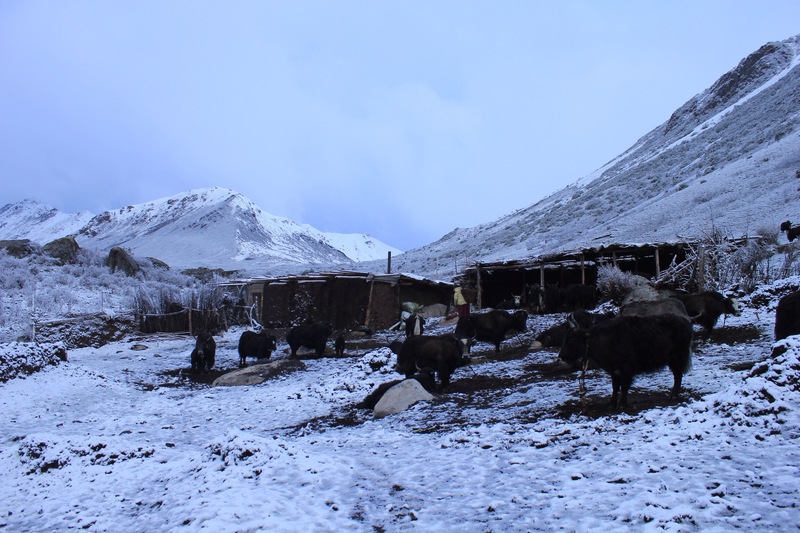 The hut was owned by a lovely man who lived there with his young grandson (we think) and their herd of yaks. 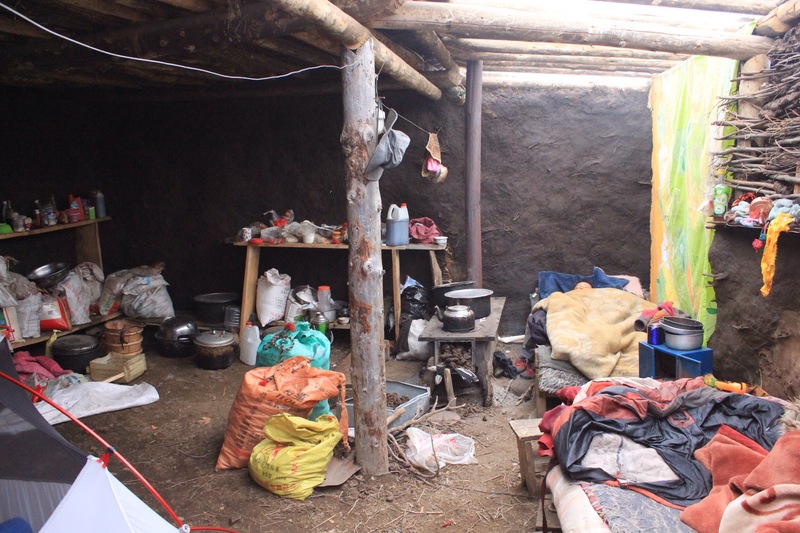 They were incredibly kind to us and we spent the evening sitting by their fire as they fed us steaming noodles cooked in chilli and rich yak ghee – the closest thing to cheese we have eaten in the last 4 months. 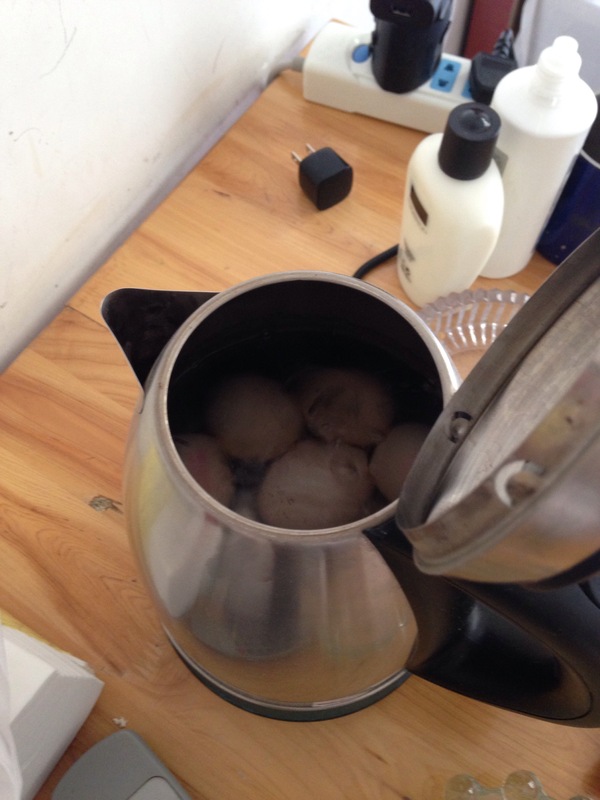 Over bowls of steaming yak milk tea, we showed them photos of our travels across China and made paper aeroplanes and boats in the light of their single electric lamp. 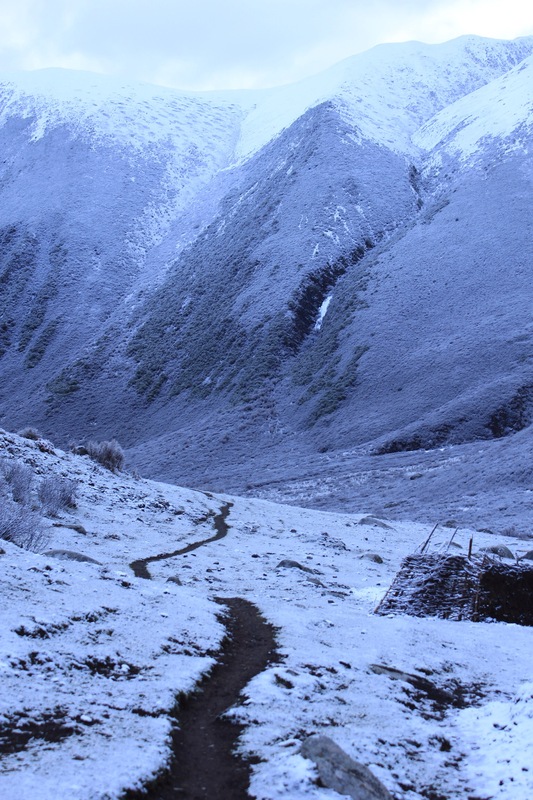 It had snowed a lot the night before and outside we found our very own 6.30am Tibetan winter wonderland. Here is the mountain we passed over the evening before – now completely covered in snow! 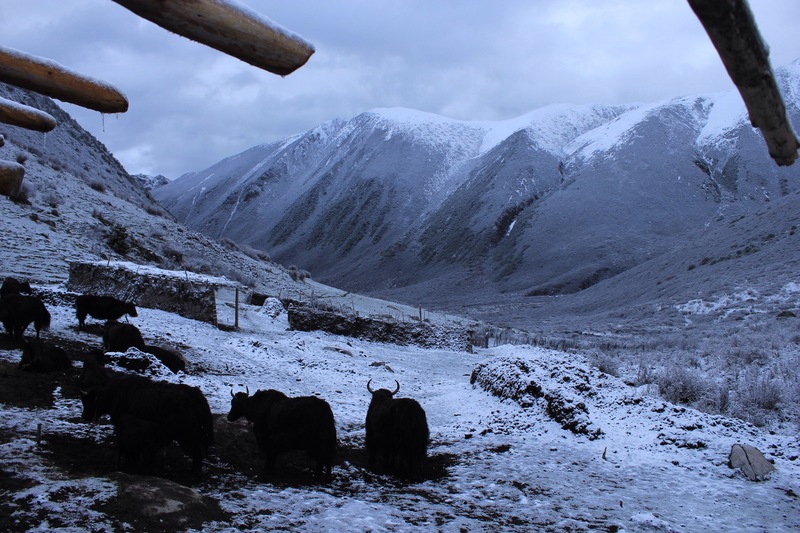 In the foreground you can just make out our host collecting the yak dung which is dried and used as fuel for the fire. I swallowed down two paracetamol and we donned our plastic bags, wet shoes and Shimano shoe covers. At the gate we said our appreciative farewells to our lovely hosts. The grandfather insisted on wearing his hat and made his grandson run back to the house to fetch it before the photo was taken. The snow had melted fast and there was barely a path across the wet land. We pushed our way through two rivers until we opened out into the next valley – here there was a good road which we turned right onto. It was downhill from here, we should get back to Ganzi that evening! We were back on glorious dirt road with another impressive scenic backdrop. 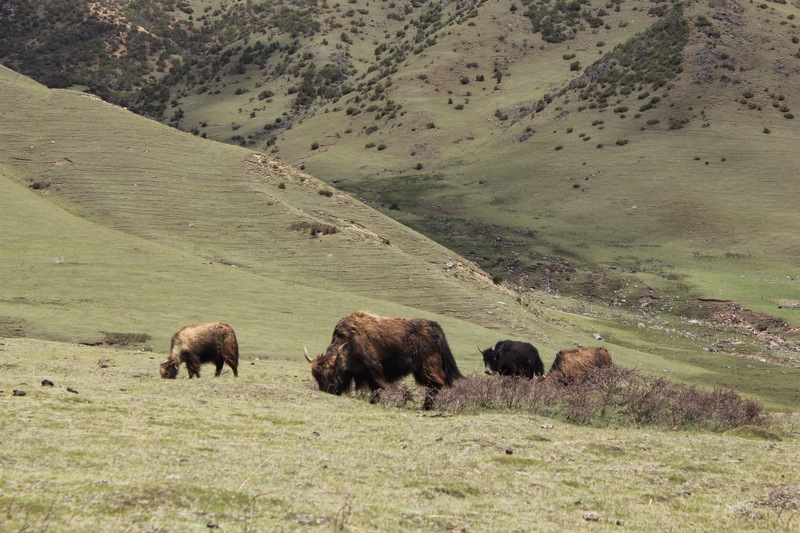 Yaks – our constant companions throughout this 6 day ride! She wouldn’t let me take a photo of her face which was amazingly wrinkled. In the bag is a large black dead bird. I spent the day feeling very feverish. 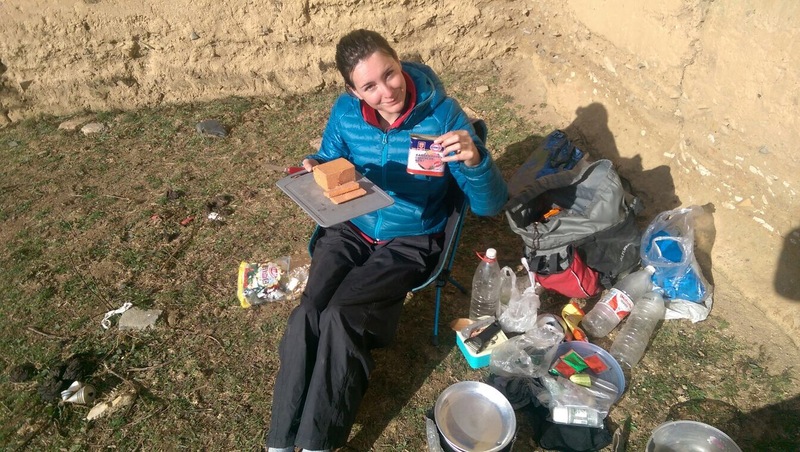 Paddy cooked lunch while I fell asleep in my helinox! We eventually got back to the paved road, and, dog tired we finished the 35km (most of it downhill) back to Ganzi. We had a good lie in the next morning but were awoken by a loud chanting coming from outside on the street. It sounded like protesters so we opened our curtains and peered down to see what was going on. It wasn’t protestors it was instead a mini ‘pep rally’ for all the staff working in the hotel opposite us. 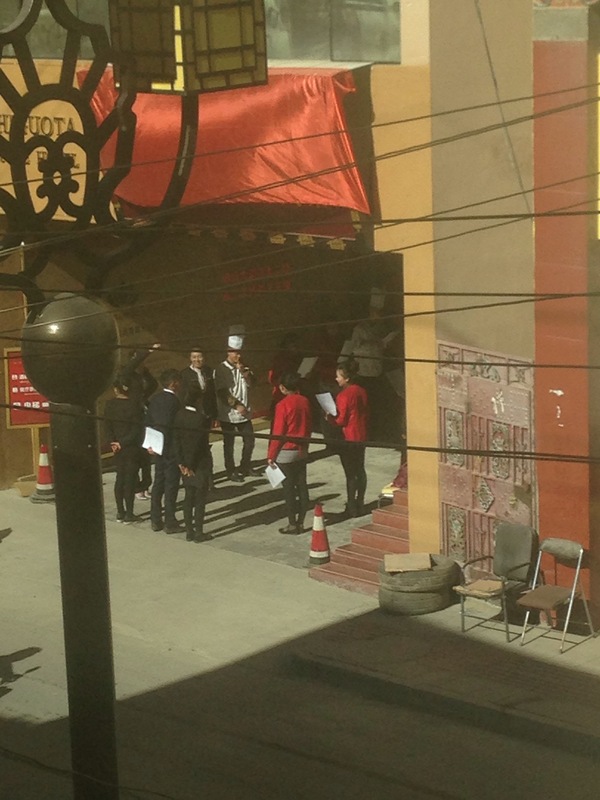 It was very surreal watching what was essentially an indoctrination session… all these young cooks, waiters and receptionists shouting out different slogans and phrases which they were reading from lamenated sheets of paper held in their hands. A young man in the middle of the circle was leading the proceedings, he would shout phrases out -sometimes right in people’s faces – and the group would answer. 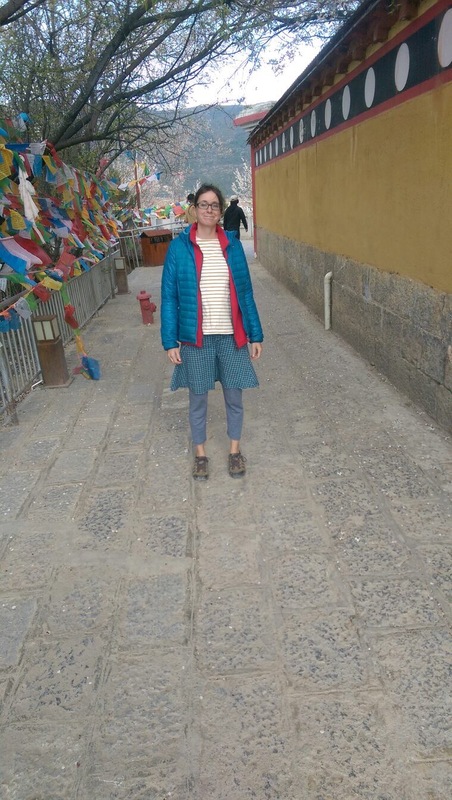 Anyway… Dege was the closest we were going to get to experiencing a Tibetan town so we spent the day exploring the sites. 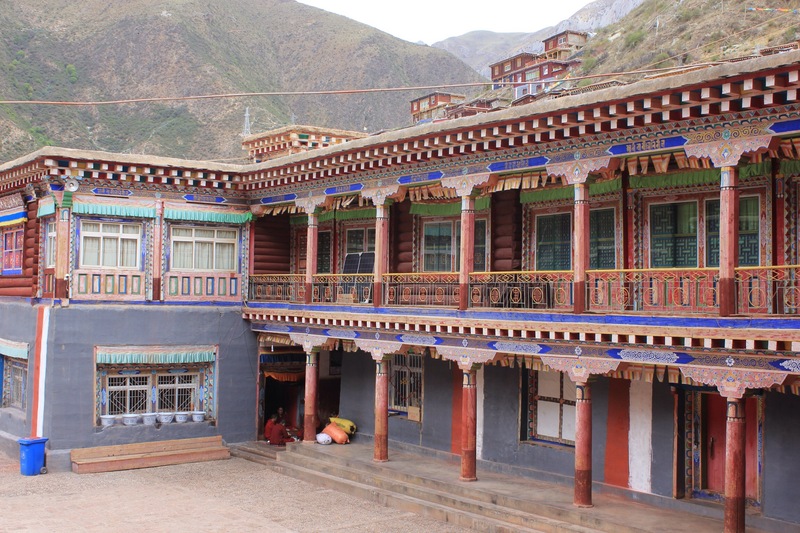 The main attraction in Dege is the Bakong Scripture Printing Press which is housed in a stunning 18th Century monastery. 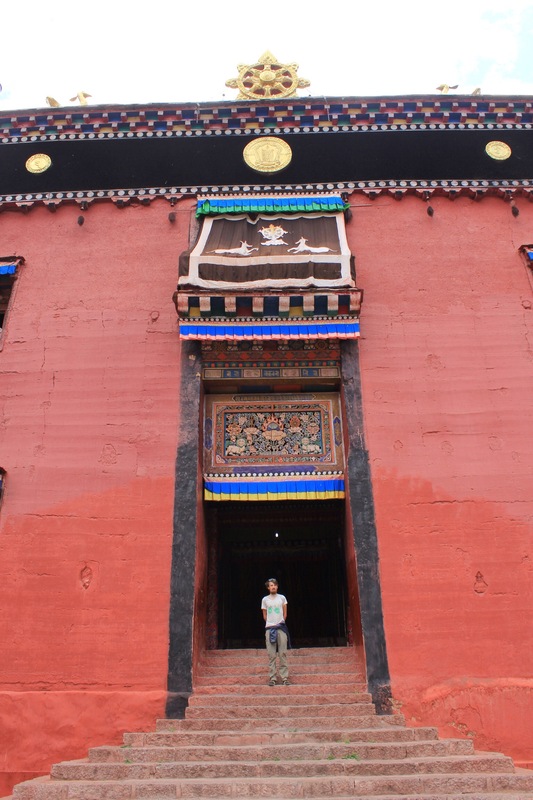 The printing press still uses the traditional woodblock method and the space houses a staggering 70% of Tibetan literary heritage, maintaining nearly 350,000 woodblock scripture plates of all the Tibetan Buddhist orders as well Bon, the religion which predates Buddhism. It’s a real shame that we were not allowed to take photographs of any of the rooms as I know my grandad (who started working in the print business when he was in his teens) would have loved to have seen some pictures. There were literally hundreds of rows of wooden pallets all engraved with the beautiful Tibetan script. A simple cataloging system on the corner of each shelf is the only means of the workers knowing which is which. 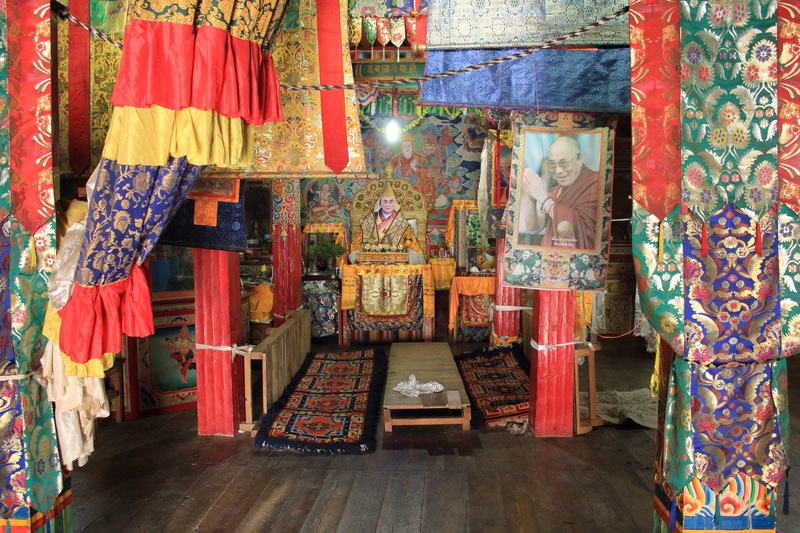 In the attic of the building, surrounded by beautifully painted Buddhist murals, were the worker’s stations – shallow pans filled with black and red ink and stacks of wooden pallets which had been used that day littered the floor. Downstairs we passed other workers cutting and soaking the long sheets of paper ready for the next days printing. 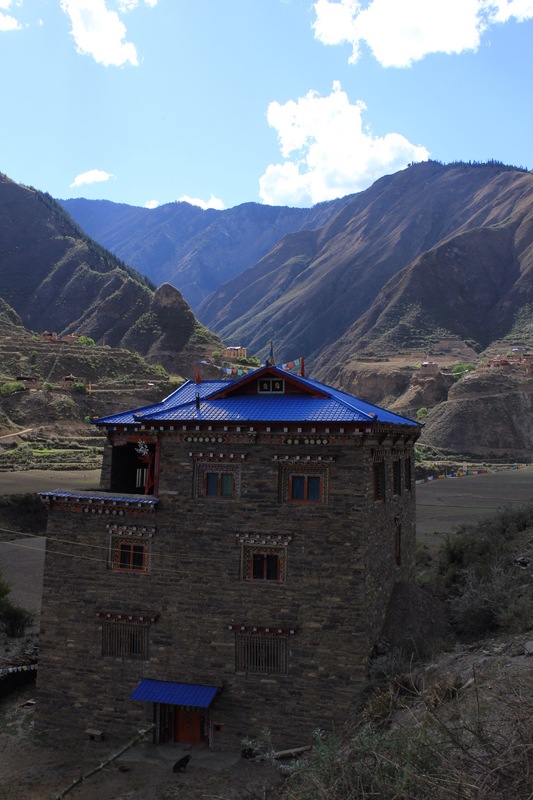 Dege itself is situated in a deep gorge, the buildings are literally built into the rock face, stacked on top of each other on either side of the river. We had a very enjoyable walk through the higgledy piggledy backstreets which led us up through the lovely Tibetan wooden houses. 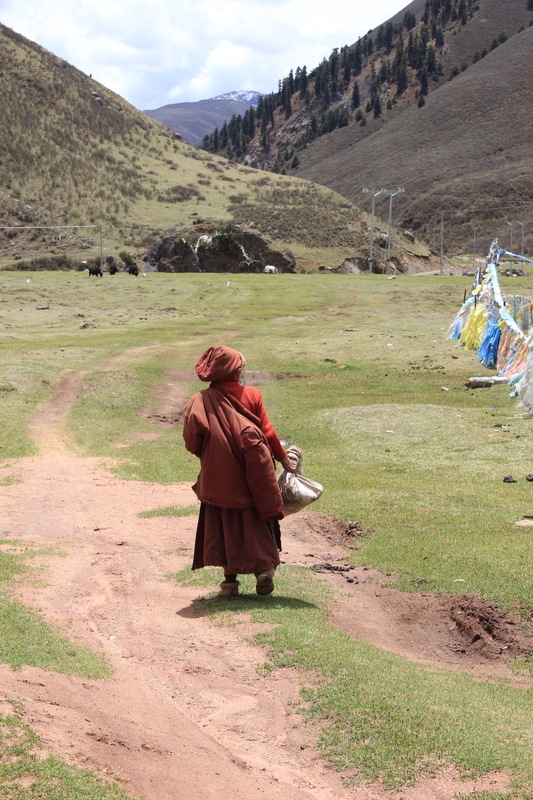 We come across prayer wheels in the most unlikely places along our walk and we pass some very beautiful women who have their long hair braided into elaborate plaits adorned with Tibetan beads. 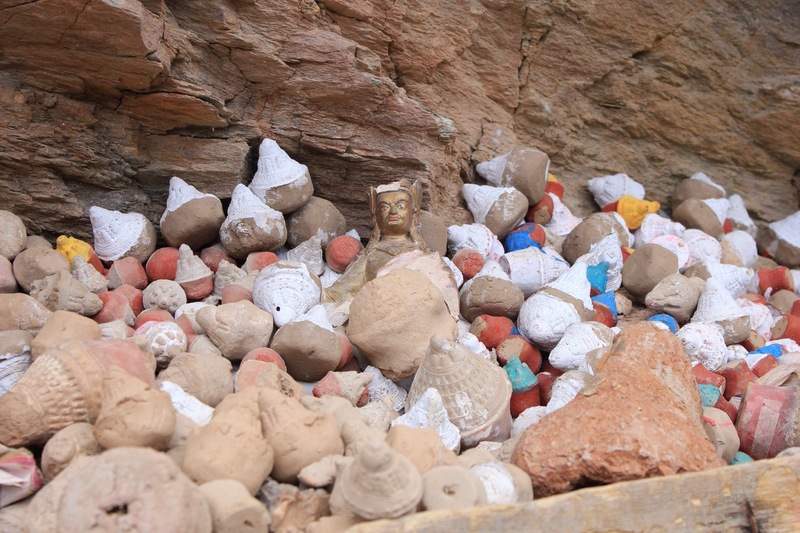 We also find a pile of discarded plaster temples, yak skulls and small Buddhist trinkets and offering sites. We also visited the very old monastery. It’s been a nice rest day and we spend the evening drinking butter milk tea, people watching and catching up on our books. 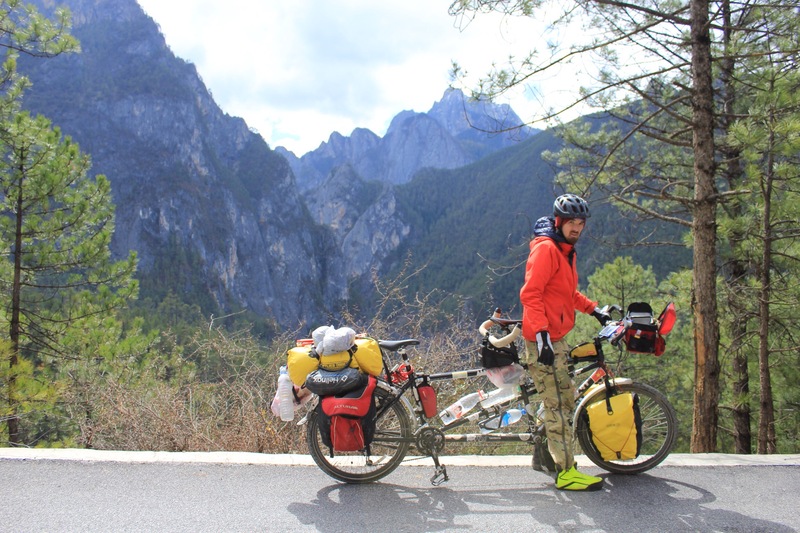 We thought we might as well try and cycle the infamous 5050m pass to Dege from Ganzi. 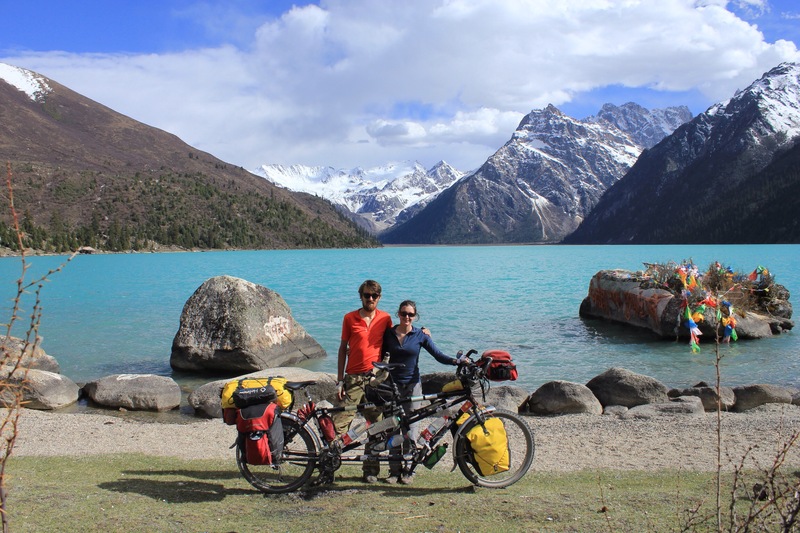 I was keen to visit Xinlu Hai Lake and as cycle tourers travelling independently, we were not going to get any closer to Tibet than this. We didn’t have time to complete the ‘northern loop’ via Bayu detailed in the Lonely Planet guide book, which would have taken 7-8 days solid cycling. 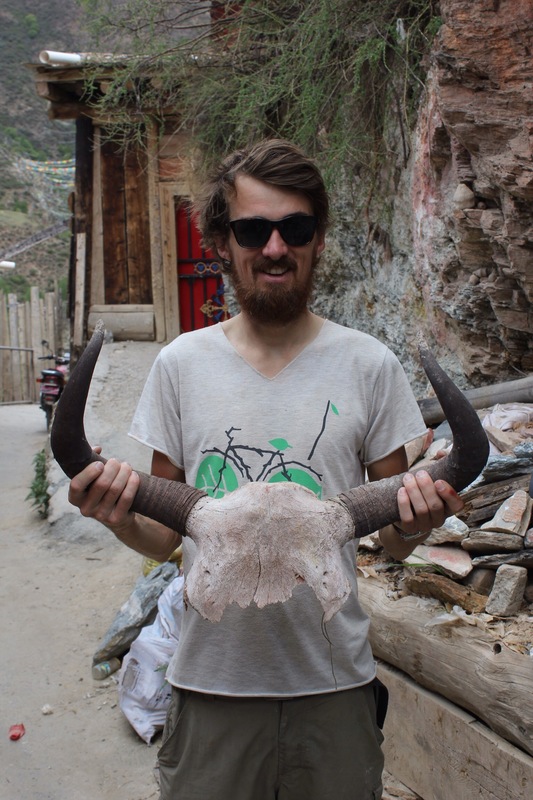 After finding a paper road map in a restaurant in Litang though, Paddy was pretty certain we could cycle to Horpo via Dege, and then cut across country via some ‘smaller roads’ back to the northern highway just above Ganzi. 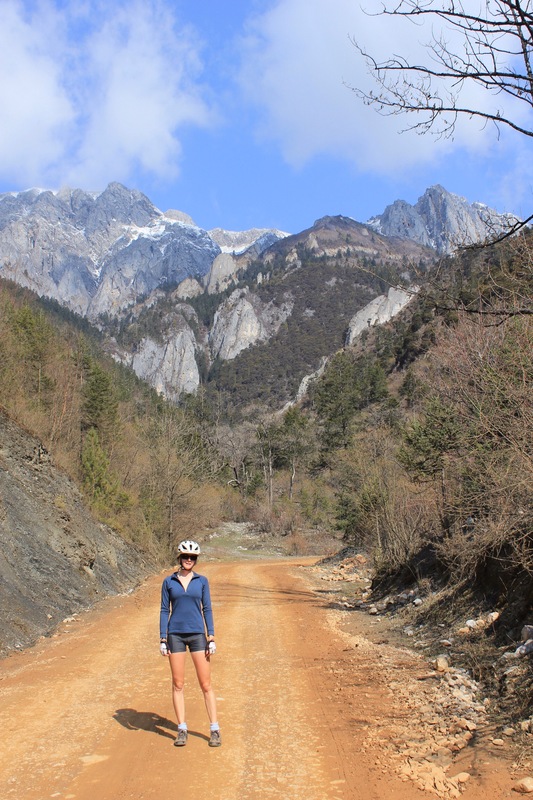 These roads were not on our OSM map but we were fairly confident of where they would take us and we were feeling fit after our previous cycles and up for a final adventure before heading to Chengdu. We gave ourselves 7 and a half days (including a rest day in Dege) to complete the loop and we certainly got our ‘adventure’. This ‘off road’ route ended up testing our fitness, perseverance and stamina to the max. Knowing that it would be a week of camping and cooking most of our meals we took the morning to stock up on supplies. Then after a final lunch with Emelie and Romain we hit the road, our panniers bulging. It’s a long steady climb out of Ganzi and we both find it tough. A strong headwind doesn’t make it any easier. 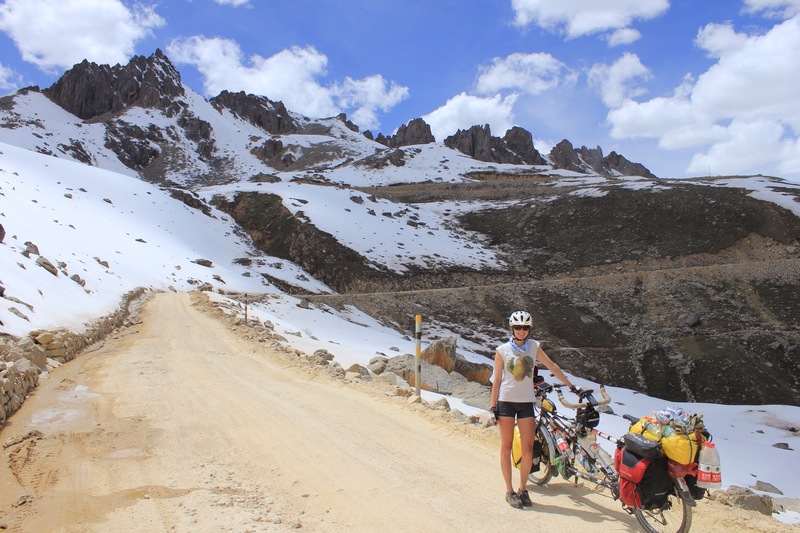 We climb and then open out onto the flat plain above Ganzi, the snow capped mountain range keeping us company to our left, the river to our right. We remind ourselves that any miles we cover this afternoon will simply make tomorrow’s cycle up to the lake easier so we don’t push too hard. 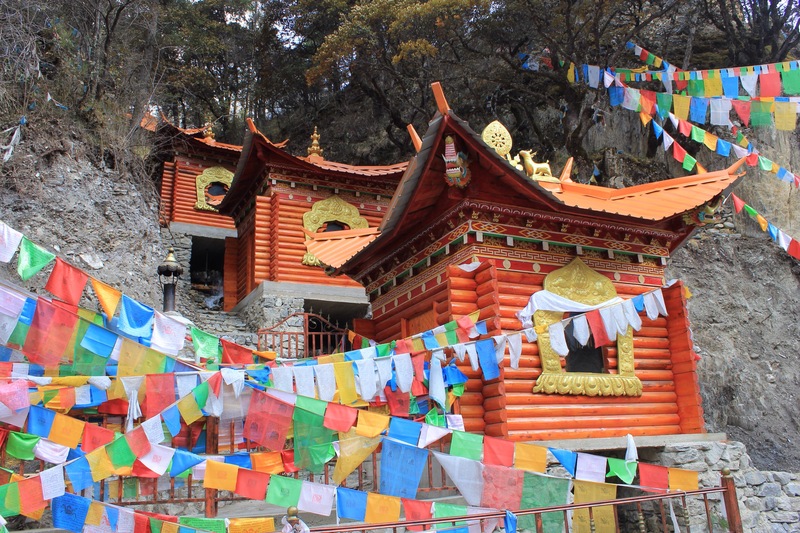 We pass some incredible gompas (Tibetan temples) with their golden roofs and collection of prayer wheels and eight white chortens. Much like the past few days, by 5pm dark rain clouds had started to roll in so we made finding a suitable camping spot a priority. We settled on this lovely river bank. 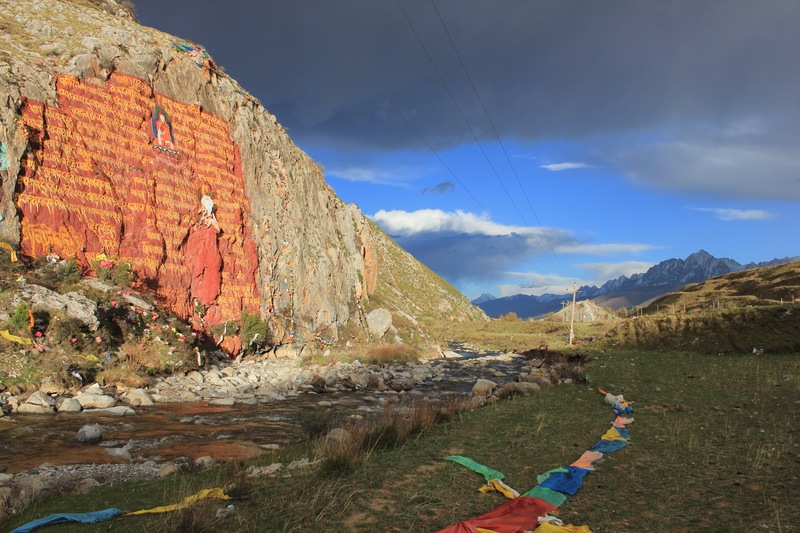 Snow capped peaks to our right and this beautiful decorated rock complete with prayer flags and bunches of colourful flowers to our left. It is obviously a holy site and we hope its ok to camp here. Paddy captured the mood of the sky very well in this picture. The next morning we had a late start as we were both tired. 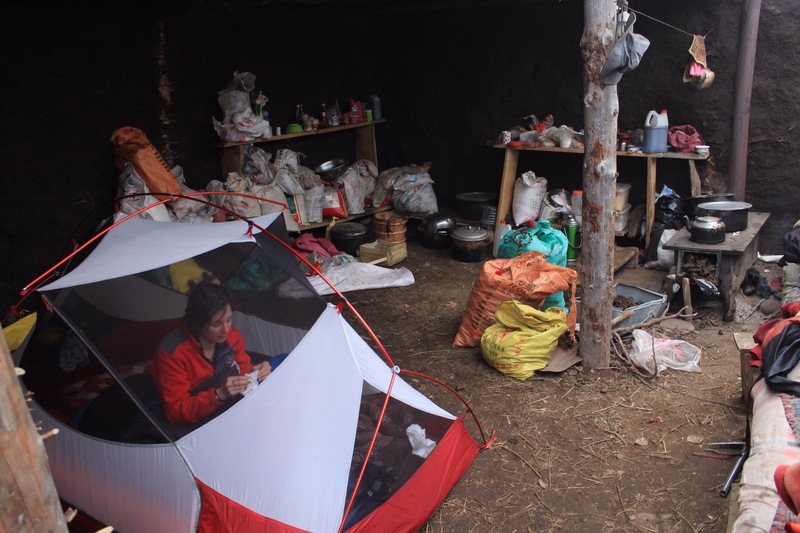 I guess we hadn’t really had a rest day since Litang… We got breakfast going and finally finished packing at around 9am. We hadn’t been going long before we were waved down by five women who were sitting on the grass having their own breakfast of homemade baba bread. As we sat together sharing bread and oranges they explained they were on a pilgrimage, walking to Lhasa, the capital of Tibet. Each night they would stop at a monastery along the way. After waving them goodbye and wishing them luck we carried on with our steady climb towards the town of Manigango which lies 15km away from the lake and where we planned to have a late lunch. Before reaching the town, there was one final important point of interest for us on this stretch of road, and that was where we guessed we might come back out to meet this road after completing the loop. 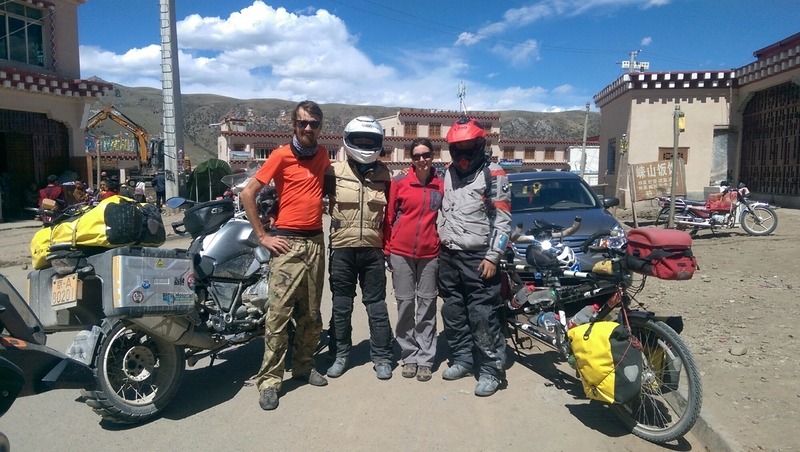 In Manigango we met a couple of guys from Beijing who were travelling by motorbike across China. Their bikes were beasts! The final 13km up to the alpine lake of Yihun Lahtso took longer than we hoped but we did stop a number of times to take some photos of the very cool glacier clad peaks. 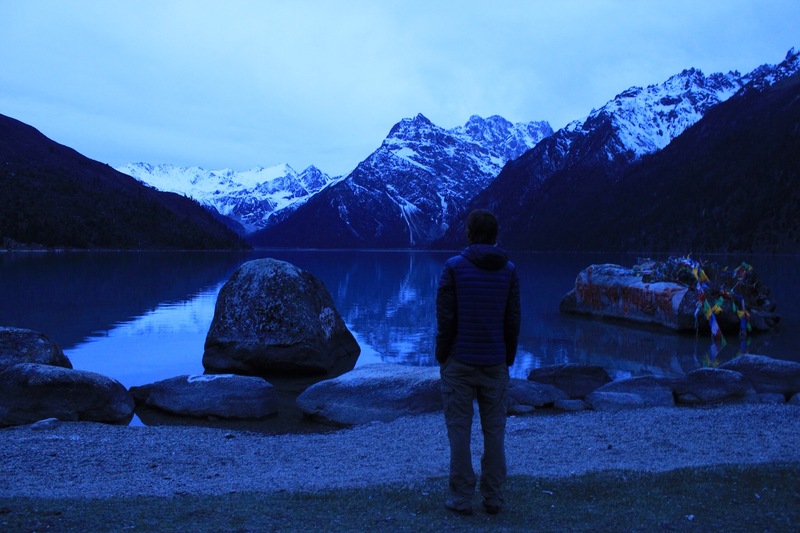 It cost us 60Y for us both to enter the lake, but boy were we glad to be camping here for the night – it is, without doubt, the most beautiful place I have ever been. 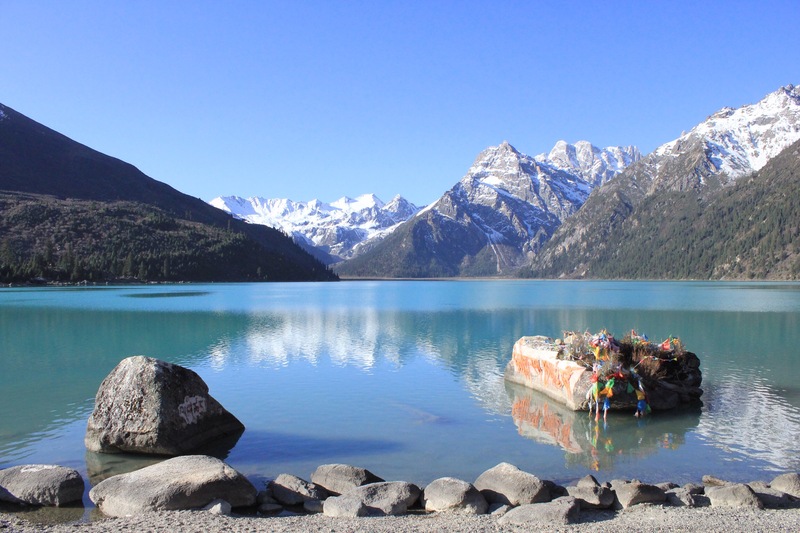 The lake is a very holy place and the rocks around the water edge are carved with Tibetan scripture. Across the water we see a group of red robed monks packing up their camp. A couple of the younger monks came to say hello. One of them was keen to try on my helmet. It was perfect, and after 6pm we had the whole place completely to ourselves. Don’t listen to the guidebook (it says camping is frowned upon) which we find often to contain misinformation. We set up camp and cooked up one of the nicest a meals we’d had in a long time too. We spent the evening in contented silence as we both lapped up the view. It was perfectly still and so silent. 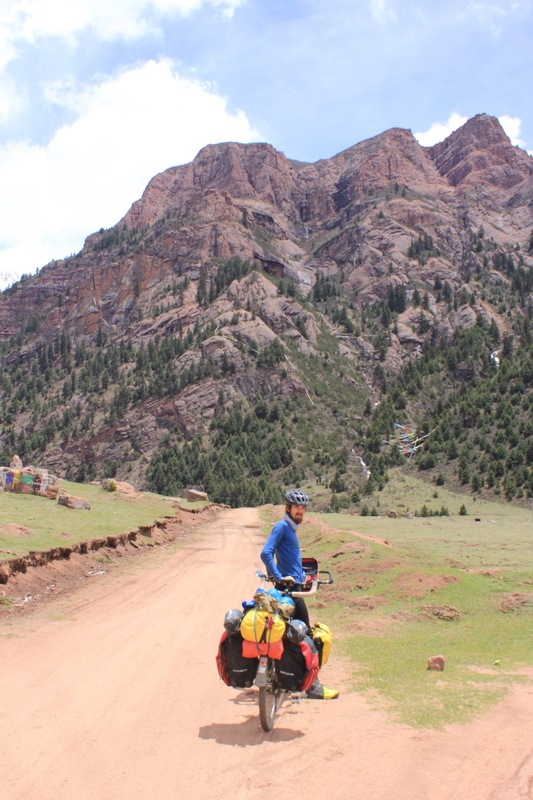 Day 3: Chola Mountain and the long downhill to Dege. We both slept well despite the frost! Getting up early was sublime and we lingered for a long time not wanting to leave this idyllic place. 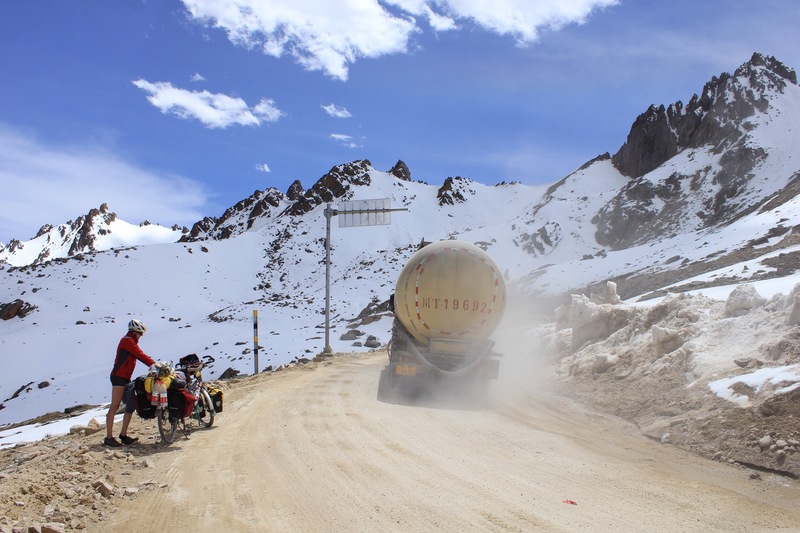 We needed to press on though as we had the infamous Chola pass to complete today – a bumpy, dusty, busy road which would see us climb to 5050m – our highest yet! 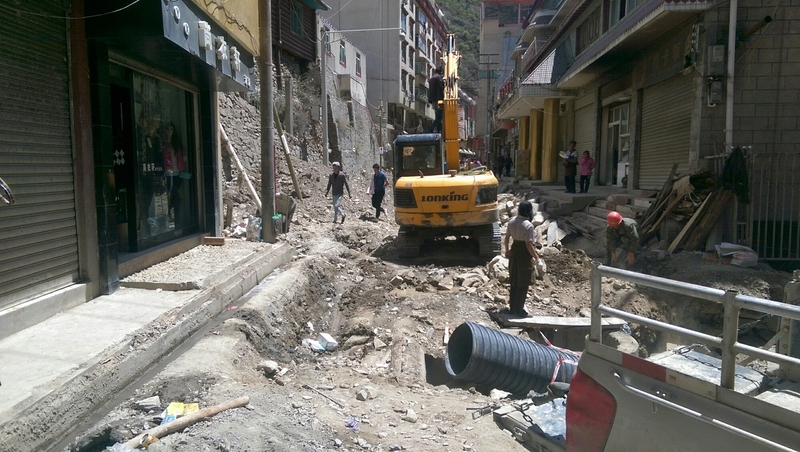 Constant upkeep by two teams, one on each side of the mountain, ensure the road doesn’t crumble away. This meant we did get some restbite to enjoy the views! As we approached the summit we both commented on our acclimatised lungs as neither of us had any hint of altitude sickness. 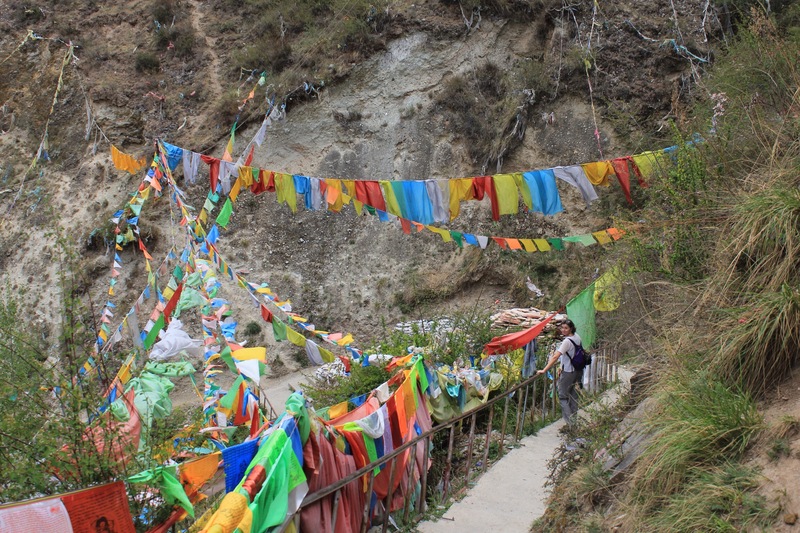 We reach the top which is decorated with the standard collection of prayer flags and while we’re stopped we get showered in lots of colourful prayer confetti which drivers fling out the window as they pass. The downward stretch isn’t too bad – about 70 mins – we concentrate on getting passed the trucks (we’re faster than them) and we finally get back onto paved road. It’s 4.30pm and we’ve done well for time. We weren’t planning to get to Dege until tomorrow but a closer inspection of the map showed it was downhill 40 or so km all the way to the town. On the way we pass by a guy who is wearing knee pads and wooden slats on his palms. 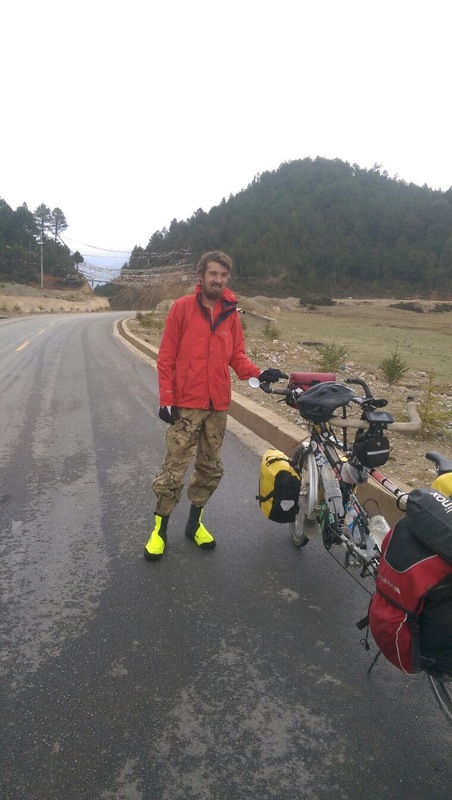 Yes, he is undertaking the ultimate pilgrimage – bowing the whole way to Lhasa! We pass through some lovely countryside including an impressive gorge and reach Dege around 7pm. 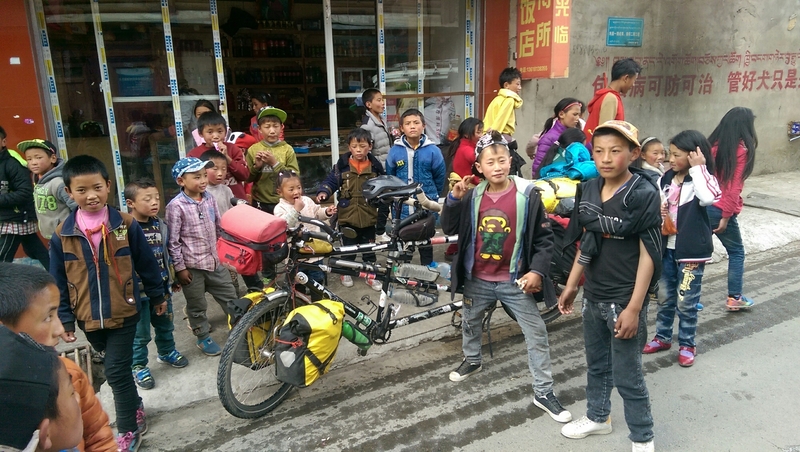 We gave ourselves 4 days to cover the 260km from Litang to Ganzi. We would be cycling with Romain and Emelie who were not feeling 100% having caught a cold a few days before, and the four of us had unreliable info about the state of the road. It turns out we managed it in three days. Romain and Emelie are troupers and we liked camping next to them (in our identical tents!) and enjoyed their company very much. 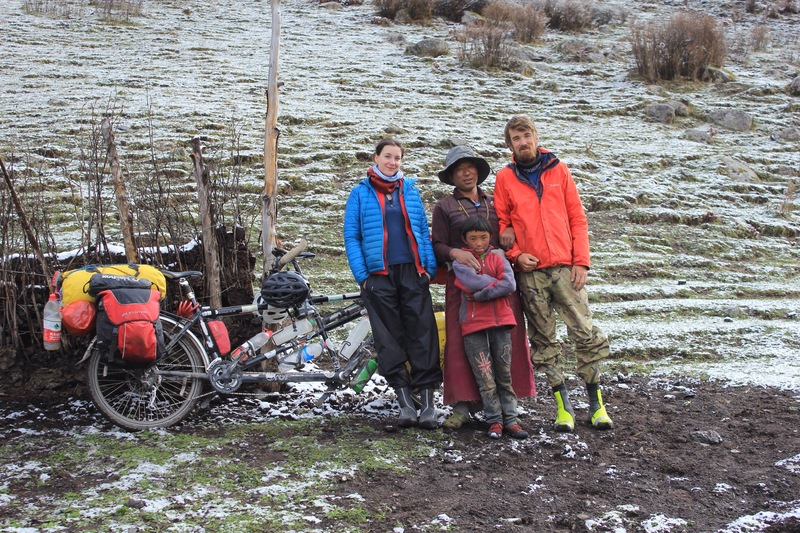 They have been travelling for over a year on their bicycles and were good at getting us up in the morning! Here is an overview of our ride together. 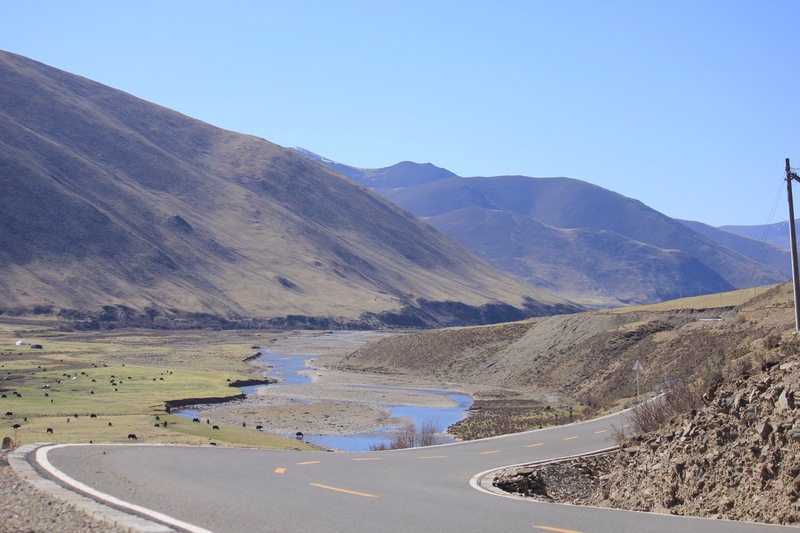 Road: excellent for around 80km where we then hit major road works and had to follow a bumpy, dusty road for the final 20km… there is a long tunnel (3km) just outside Litang which helps a lot. Because we’re on a tandem we have more momentum than a single bike so we tended to lose Emelie and Romain on the down and flat sections of the ride. 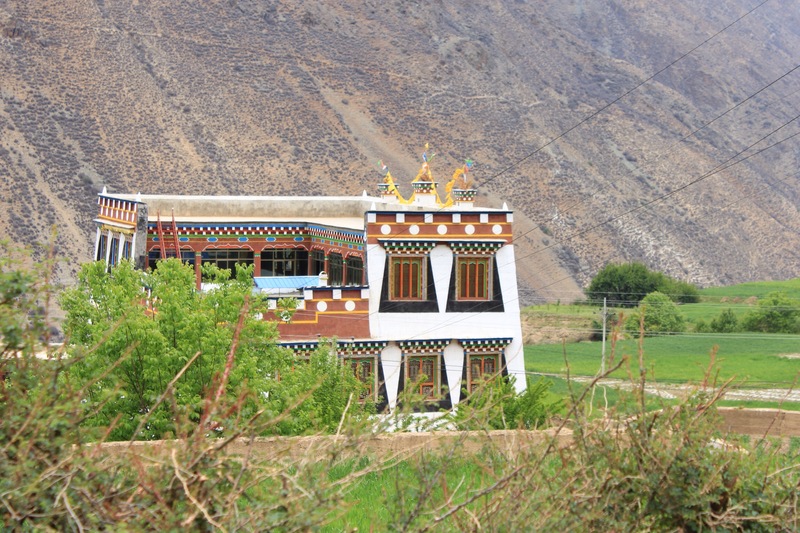 We passed some beautiful scenery on the way including the most amazing valley, peppered with yurts and mountain top stupas. 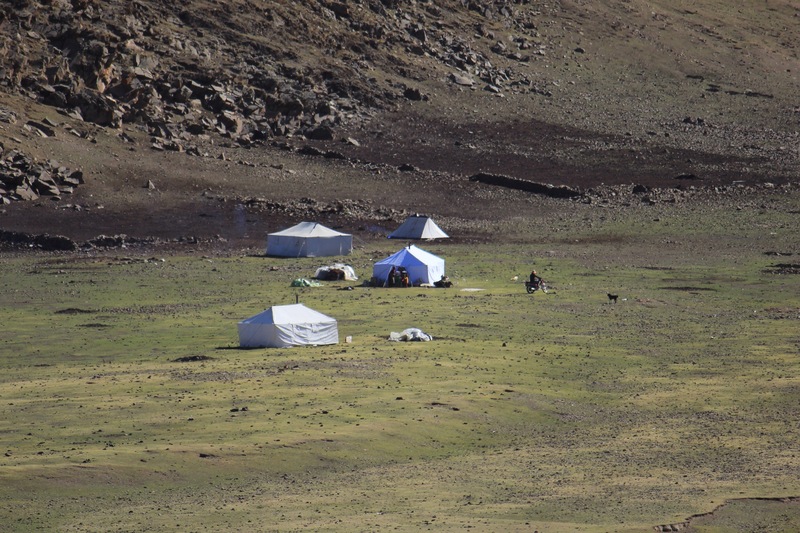 At the top of the climb we are invited into one of the tents for tea. As we come back out to get back on the bike we see E&R coming up the hill. Perfect timing as its nearly lunch time! We all enjoy the long down hill section and it’s incredible how warm it is at the bottom of the valley. 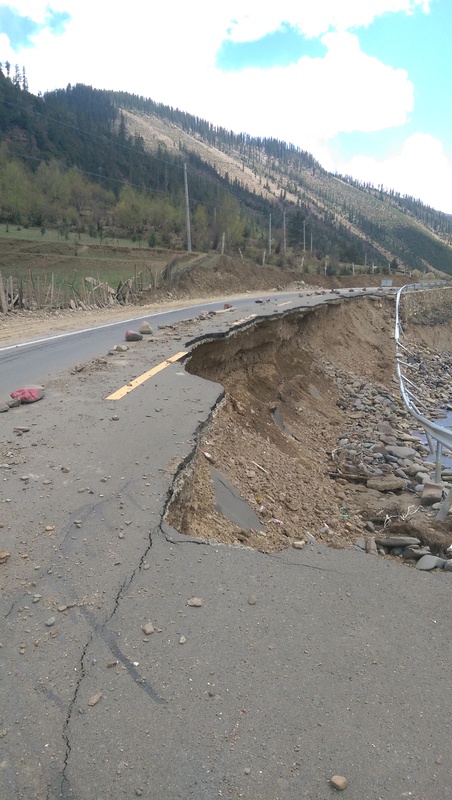 There is some pretty crazy bits of the road which are just collapsing into the to river though. Mobbed by interested children when we stop to fill up our water bottles! Later in the day we find the perfect camping spot near the river but have to cross this rather precarious bridge to get there. Road: very nice. Take the tunnels where possible. We wake up early to another clear, beautiful morning. 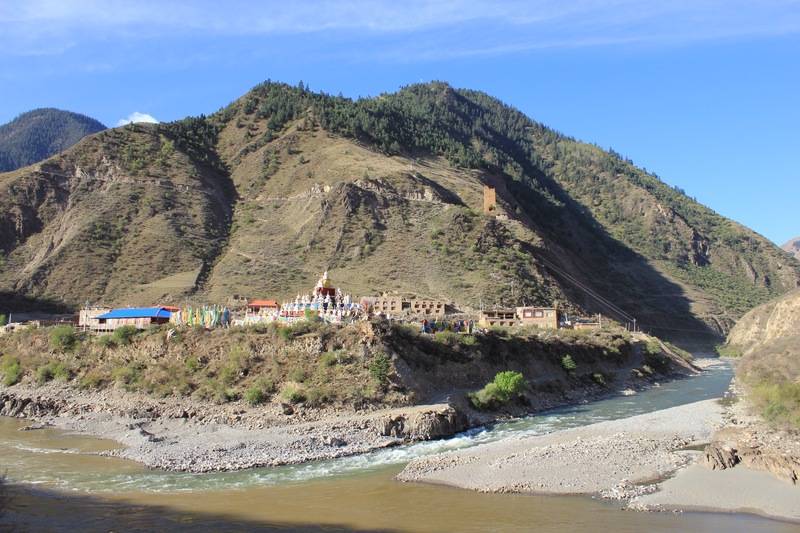 We follow the river and pass some big Tibetan temples and monasteries. What a place to live huh?! We agree we will stop and find a camping spot at 4.30pm. The weather threatens rain and sure enough by 5pm there is a big thunder storm. Luckily we find an abandoned shack which is big enough for both our tents so we shelter here for the night. Road: very up and down but road surface is generally good. The weather luckily clears and we set off hoping to complete the final 75km to Ganzi by late afternoon. Snow capped mountains come into view as we climb up. We have a final lunch together before completing the final 30km to Ganzi. 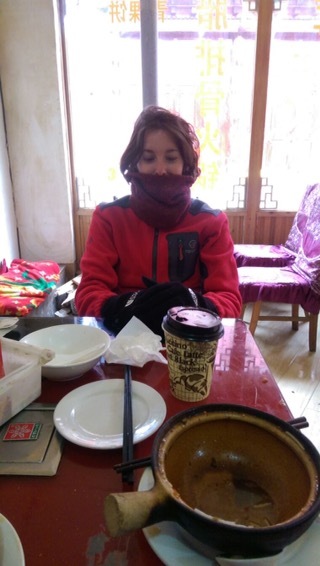 Romain and Emelie are still feeling pretty ill so we venture out of our dark cold hotel and find a great cafe where we gorge on Tibetan yak pie and rich butter milk tea before turning in. 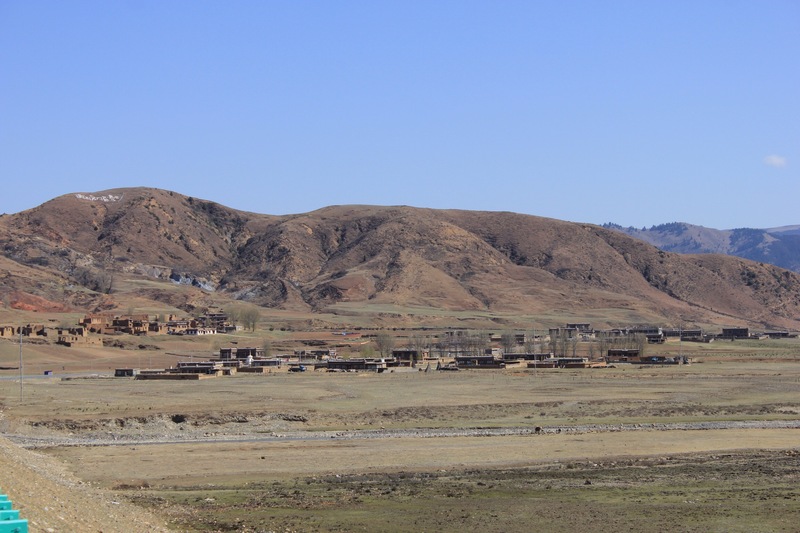 One of the main reasons for us both looking forward to reaching Litang was the prospect of potentially meeting some other travellers. However great it is to get off the tourist trail and spend the evening trying to communicate with the locals (armed with your smart phone and dictionary app), occasionally you crave a more ‘fluid conversation’. Apart from our couple of nights with JK and a brief evening with some people during our trek in Tiger Leaping Gorge, Paddy and I had spent the last 28 days being each other’s sole connection to conversational English.We were in serious need of some fresh topics of conversation! 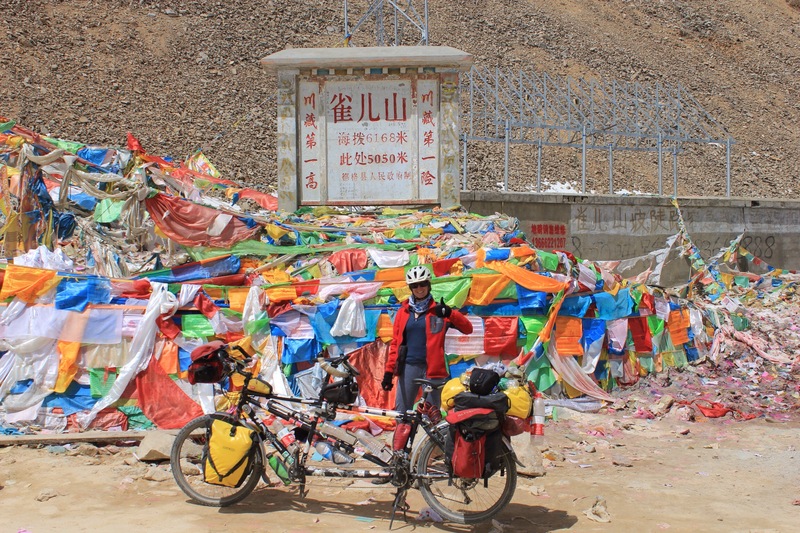 Litang didn’t disappoint, and we not only met other travellers but also managed to meet a number of other cycle tourers. 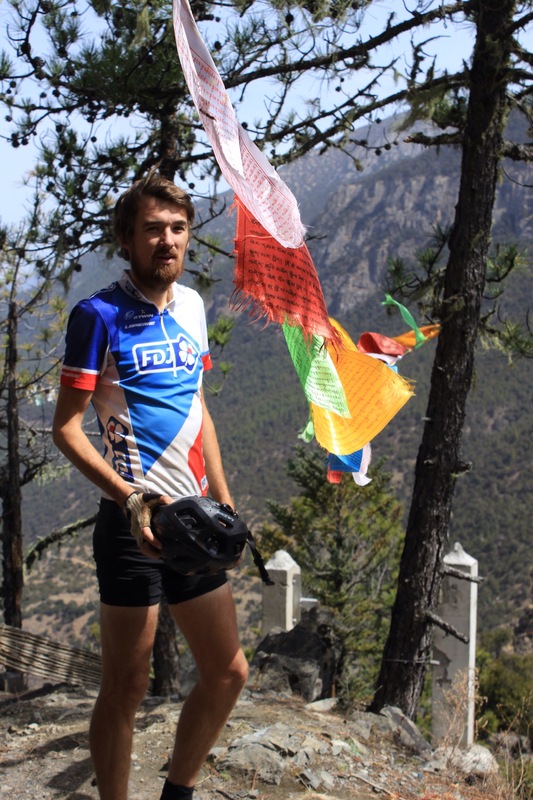 We met a French cyclist, Jerome as he cycled into town looking for a hostel. 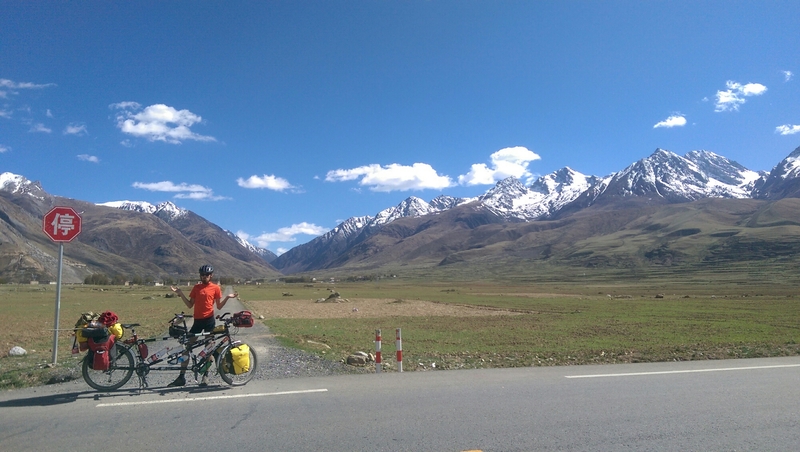 Jerome has been on the road for a long while having cycled all the way from France, through the Pamir, down into Pakistan and up into China. 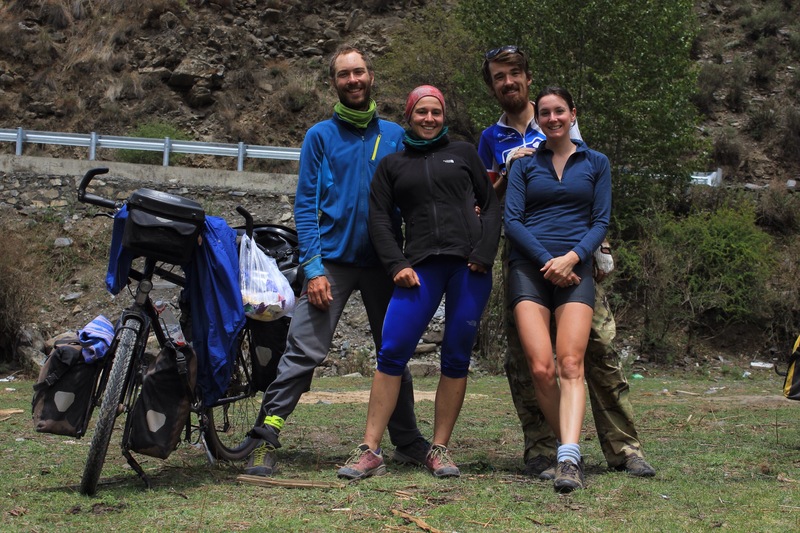 We also met another French cycling couple, Emelie and Romain, (also been on the road a long time) while they were trying to extract cash from an ATM in town. 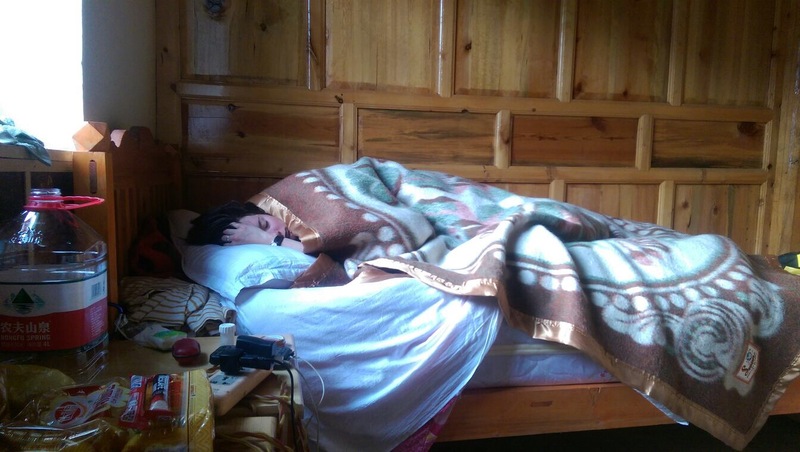 They ended up staying in the same hostel as us. To complete the group, JK, our South Korean friend who we had last seen on a snowy mountain 5 days before turned up at our hostel on the eve of the first day. 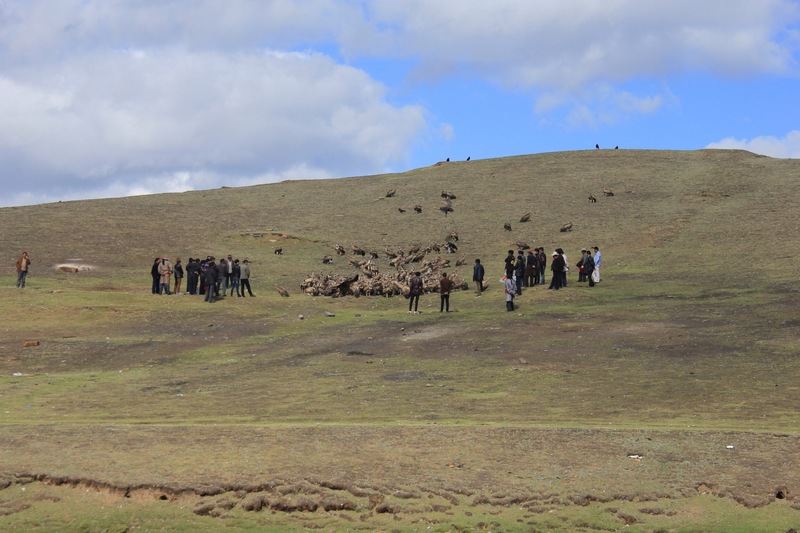 Paddy, JK and I got up early one morning to attend a sky burial which we had heard was taking place on the hill above town at 7.30am. 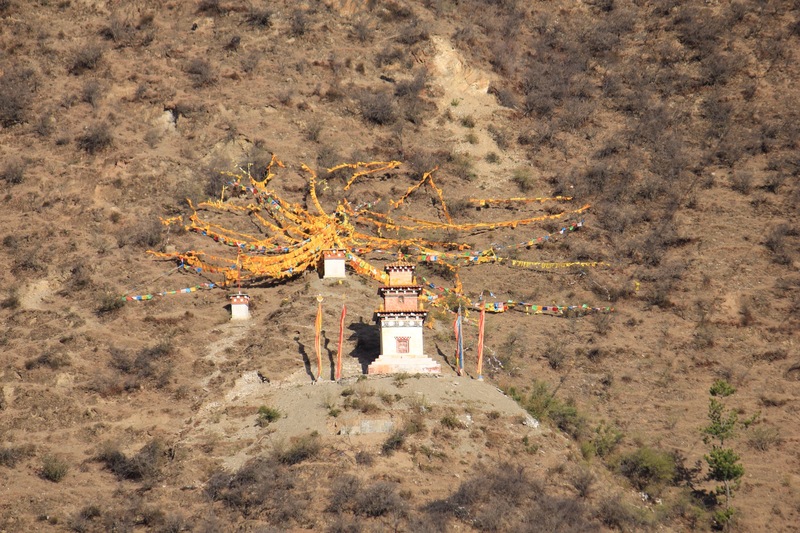 For those who haven’t heard of the sky burial (or Jhator) before, it is the final act in the Tibetan funeral ceremony. 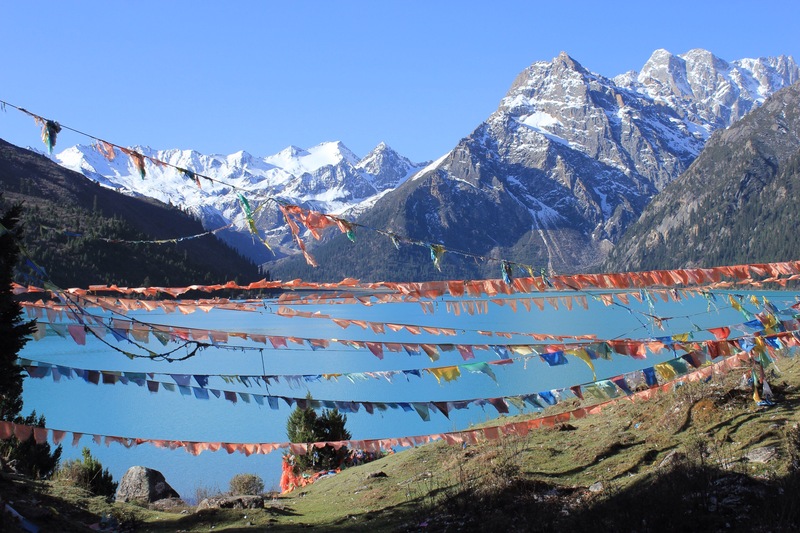 In an area of the world where soft ground and timber kindling is hard to come by, ordinary Tibetans are instead, honoured through Jhator. 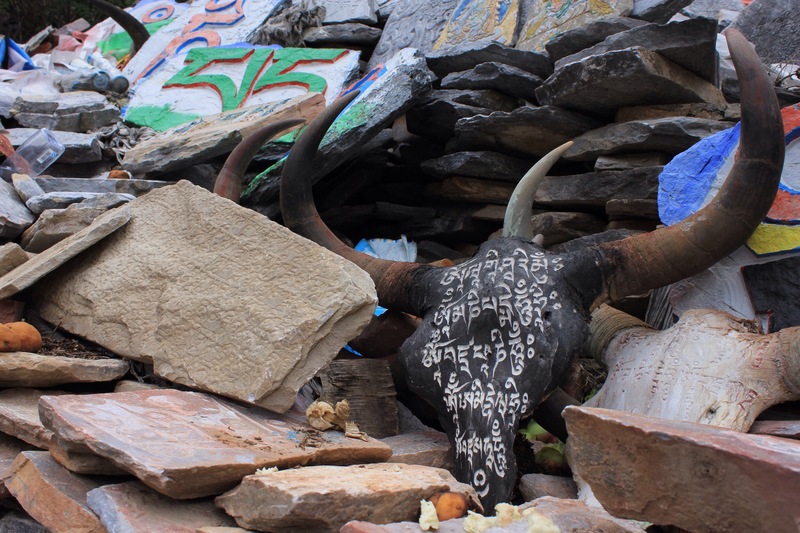 The body arrives having already gone through a number of rituals and ceremonies. 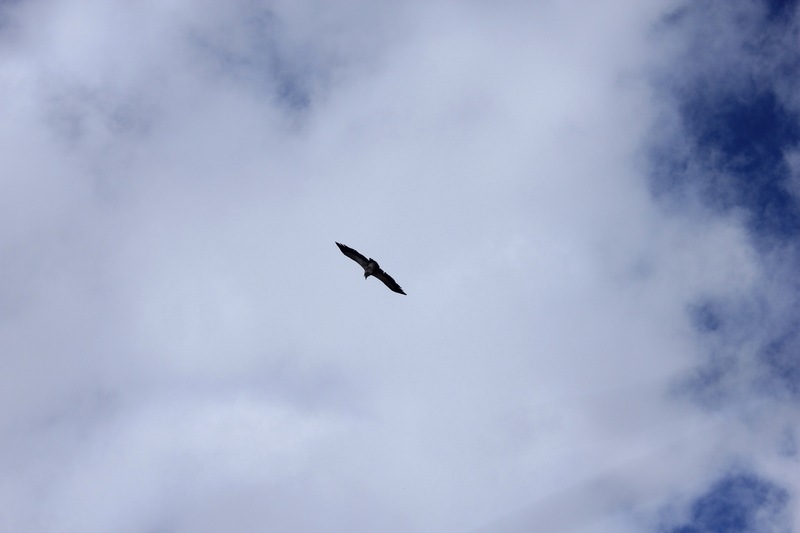 It is taken to the offering site which is home to a large pack of vultures. I expect you have guessed what happens next. Although this custom initially sounds very alien to us, it’s not as macabre as it sounds. When you stop to contemplate it, there is something quite philosophical, even poetical about the concept – you are (quite literally) returned to the sky. 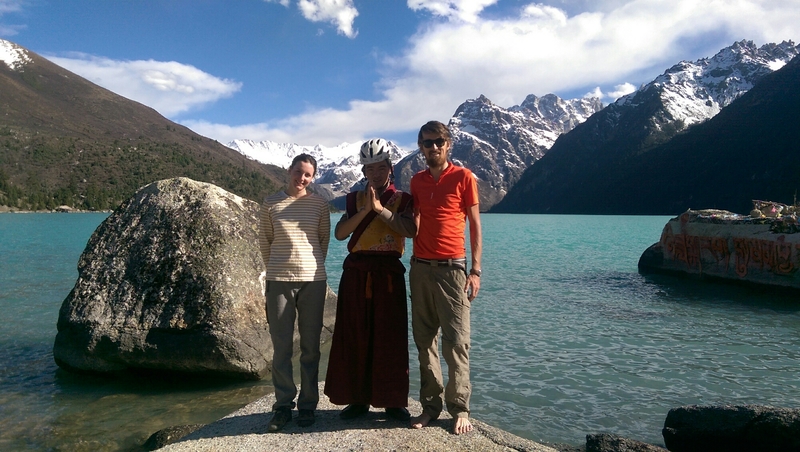 We cycled up to the site and a couple of other travellers were also there with a local guide. The colony of birds were all sitting up on a nearby hill. At around 8.30am a number of cars arrived. A group of around 12 monks sat facing the hill reciting prayers while one car drove up onto the hill and a group around 45 men (there were no women present) gathered around the vehicle. Naturally we sat a respectful distance away and once the car arrived we didn’t take any more photos. We weren’t sure what to expect but, compared to funerals back home, it all felt quite informal and, well, matter of fact. Everyone was dressed in normal everyday clothes and apart from the monks, there didn’t seem to be any ritual to the proceedings. It’s a bit of a shock when suddenly the group of men stand aside and you see the group of vultures urgently flock towards a point on the ground but thankfully we were too far away to see anything ‘detailed’. 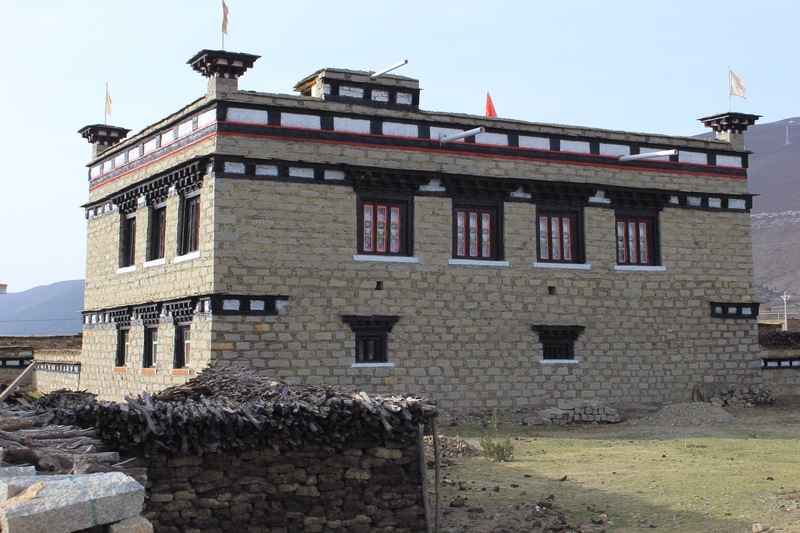 The only other point of interest in town was a quick visit to the house where the seventh Dalai Lama was born. Sadly JK wouldn’t be able to cycle the next stretch with us as he was heading straight to Chengdu and Jerome had headed off a day earlier than the rest of us, but Emelie and Romain would be heading north to Ganzi (where they hoped to renew their visa), so the good company would continue for the next few days at least. 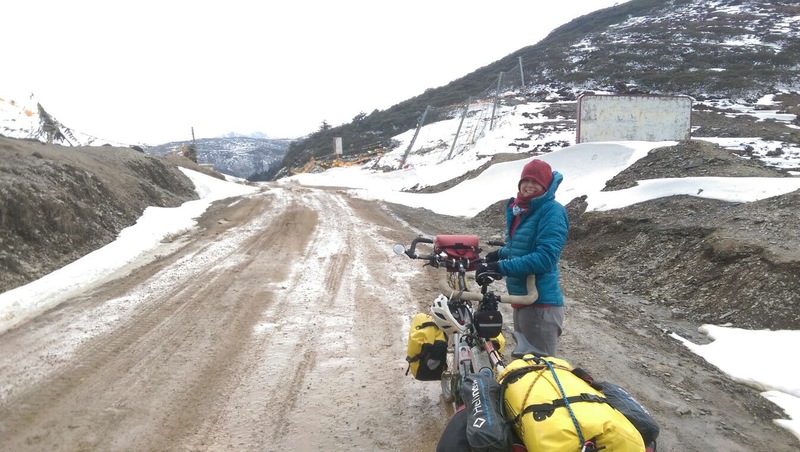 No wifi access, a series of epic climbs, rural Tibetan villages, dirt track roads and lots of camping – here is an overview of our solid seven day cycle between Shangri-la in Yunnan to Lithang in Sichuan, China. Today passed without too much drama. It was the first proper rainy day we had had cycling so we got rain geared up. Here is Paddy in his bright yellow shoe covers. 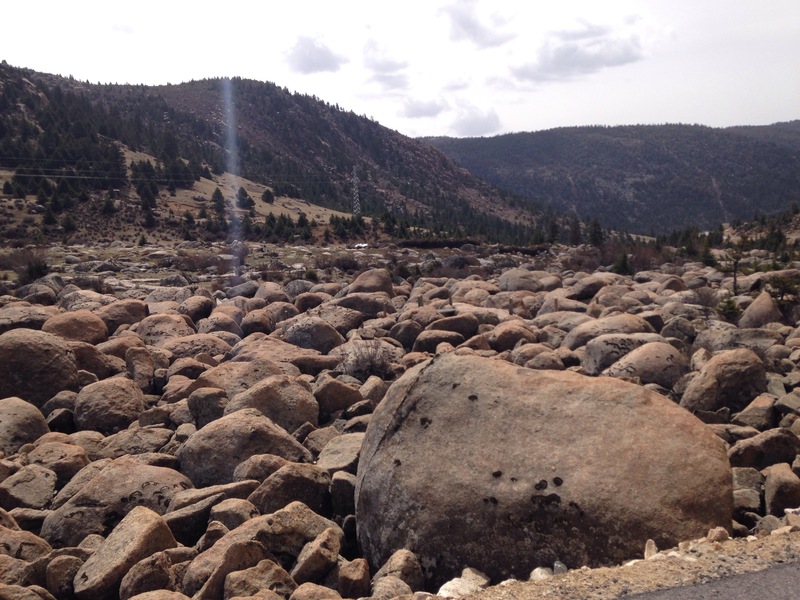 We eventually found a camping spot near a river just before the next big climb. We pitched the tent quickly and cooked up dinner in the vestibule. Twin Peaks is keeping us occupied before going to sleep! With the knowledge that tomorrow would be a very long and hard day in the saddle we planned a relatively short day today. In fact, we didn’t get out of the tent until 10am as it was still raining… We cooked breakfast and enjoyed a lie in with coffee in our double down sleeping bag. With the rain clearing we pack up and are about to set off when I spot another cycle tourer puffing his way towards us. JK from South Korea had pitched his tent 10km back down the road and was heading in the same direction as us. It would be nice to have some company so we set off up the climb together. We plough up the valley, pine forests as far as they eye can see. The rain clears and the three of us marvel at the amount of lichen hanging from the trees. It looks like spooky green cobwebs and we fill our lungs with the amazingly clean air. We reach the top at around 4ish. Great views at 3900m! Then enjoy the decent and drop back down to 3000m. 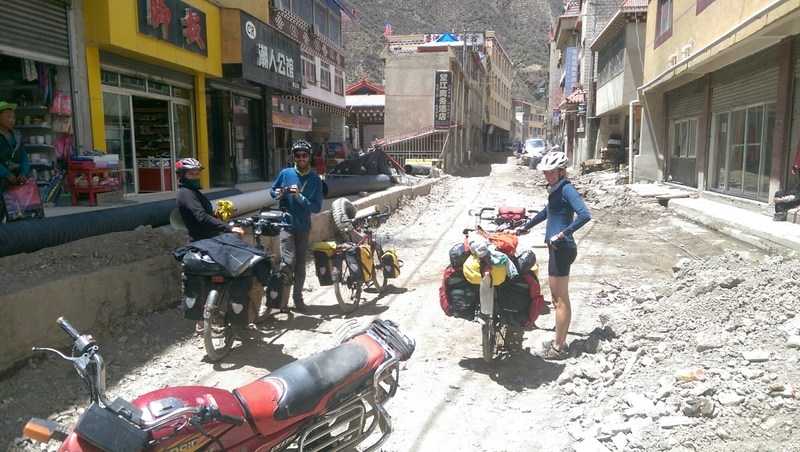 We stop for dinner and then cycle 5km up the valley until we find a basic guesthouse. We have our standard ‘shower’ round the back of the house with a bowl of hot water. A stunning and perfect day for cycling up the mountain! We leave the Tarmac road behind but the dirt track really isn’t too bad and there is barely any traffic. 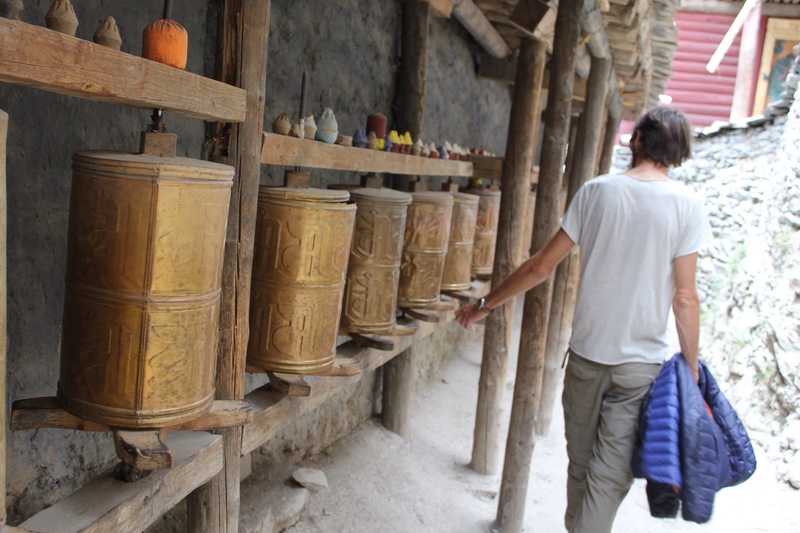 We pass a collection of prayer wheels all being continually spun by a small stream below each of the ‘temple huts’. This lovely couple stop and give us fruit and sticky honey rice cake. We say goodbye to JK after sharing lunch as he decides he will only go on a bit further and set up camp. We push on wanting to get over the second climb so we can drop down before finding a camping spot. 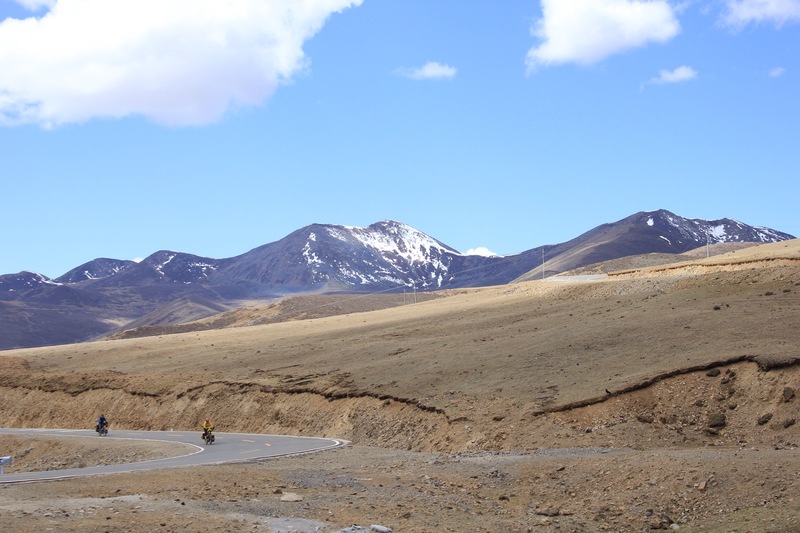 We had climbed for 4.5 hours – around 35 km – and reached the top which sits at 4400m. 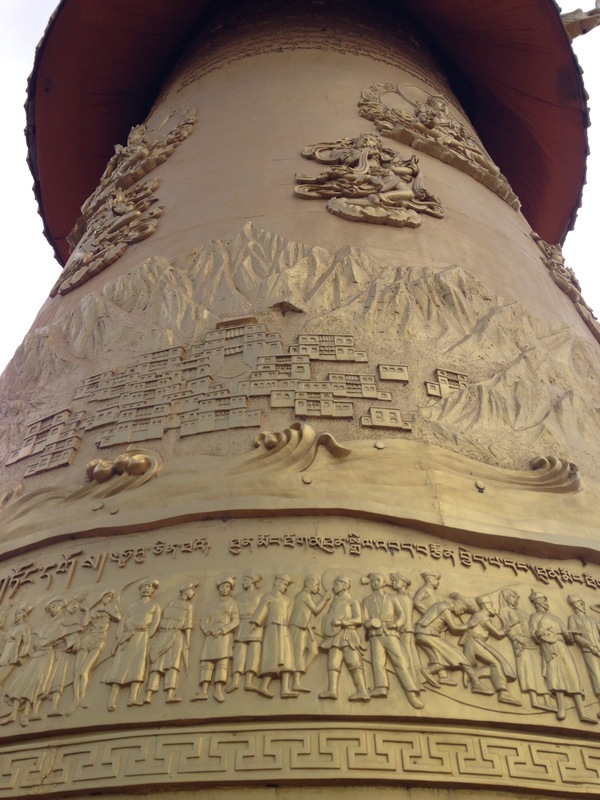 This marks the gateway into Sichuan. There is a lot of snow and it’s very cold! The weather really starts to close in and we’re keen to get down as far as possible before setting up camp. The road on this side of the mountain is REALLY TERRIBLE! Please please give us back some tarmac! 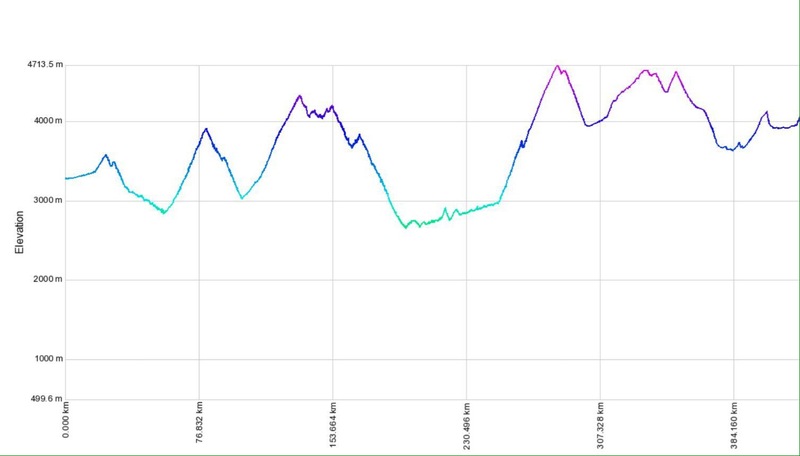 It’s a bumpy ride and we still have another small climb before we can really lose some height and get down to under 4000m. We’re glad to see a makeshift building in the valley and there is smoke rising from its chimney! The guy lets us in and we get warm by his big fire. We don’t have much in the way of food but he sells us 4 noodle pots which we add some boiled rice to. Not a great meal considering how far we’ve climbed but at least it’s something. We pitch our tent on the gravel lay-by opposite the hut. The pigs attack our loose rice bag but otherwise we sleep pretty well. We hope JK is ok and that he’s not too cold in the snow. 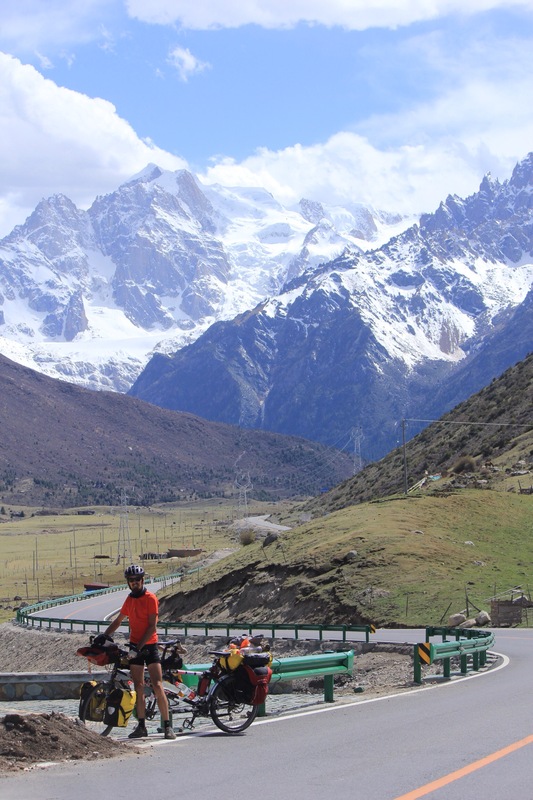 Another great day weather wise but the bumpy road continues for a long time and we have a small climb to complete before a very uncomfortable decent all the way down to below 3000m where we find ourselves in a green lush valley. 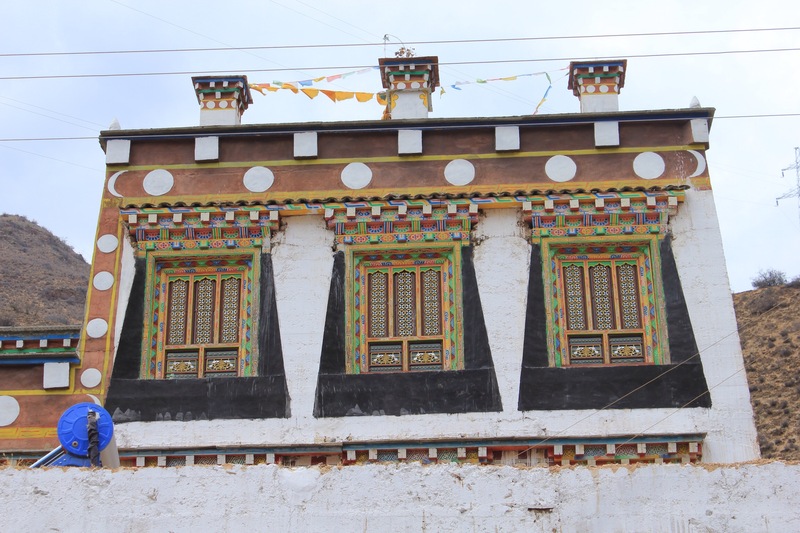 All the houses are built and painted in the same Tibetan style, this time with flat roof so. I think they are beautiful! 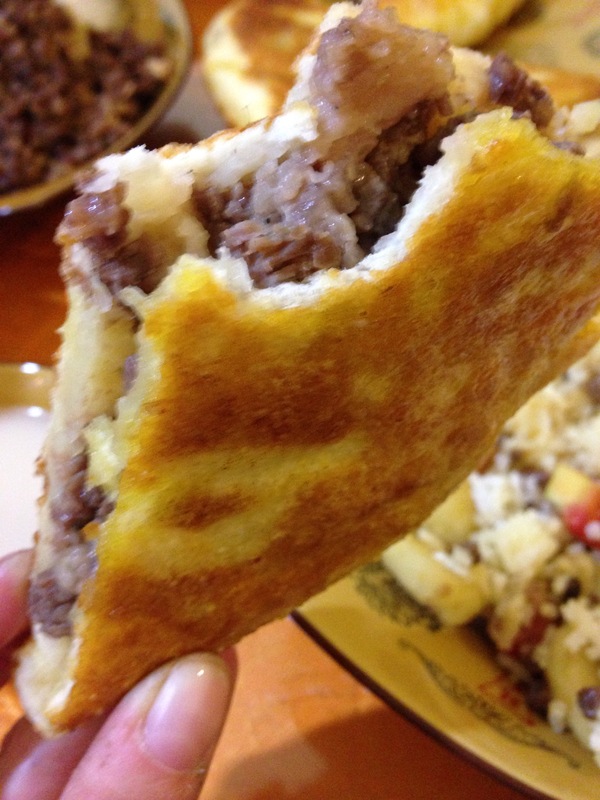 We stop in Qung Mai Xiang for lunch where we gorge on a big feed. It’s good not to be eating instant noodle soup again. 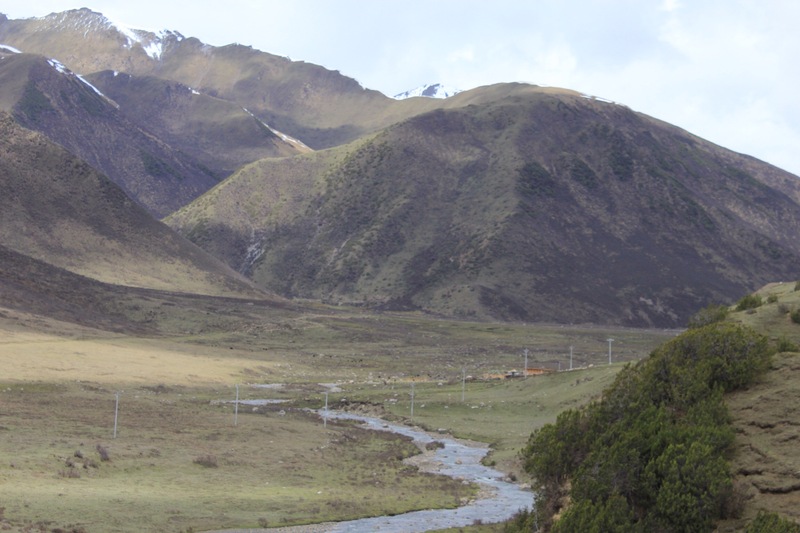 We keep climbing back up to 3000m where we stop at a small village directly above a large hydroelectric damn. This marks a good place to stop as it is directly before the start of the big climb tomorrow. We find an hotel of sorts (former digs of all the workers who obviously built the damn.) There’s a warm shower which is sublime! We spend the evening with the family next door and the kids practise their English on us. 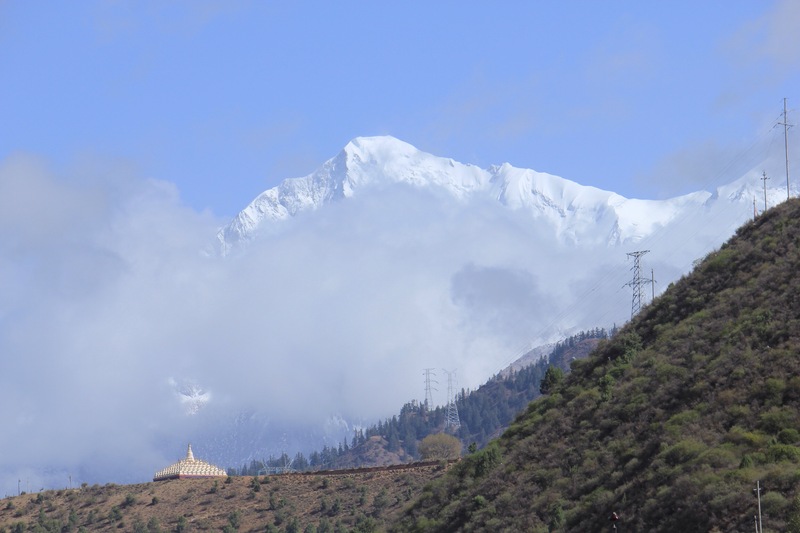 Day 5: The big one – 4718m! Another stunning day – we have been so lucky with the weather! A big big climb today so we start early. 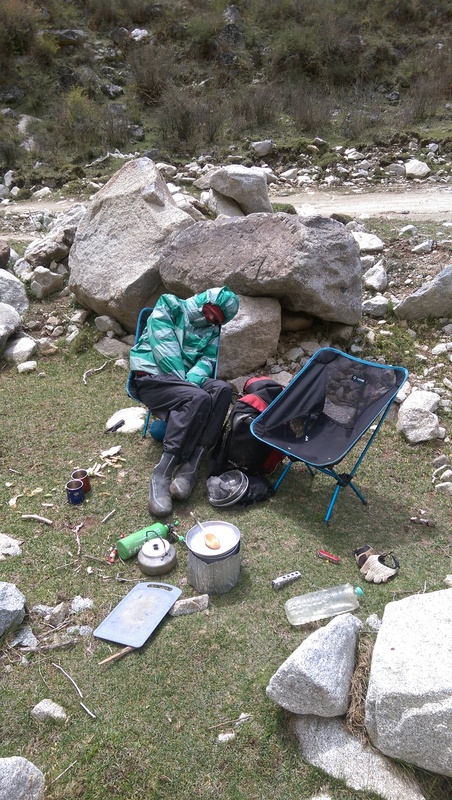 We climb steeply for about 4.5 hours and then stop for lunch. The road remains blissfully paved. 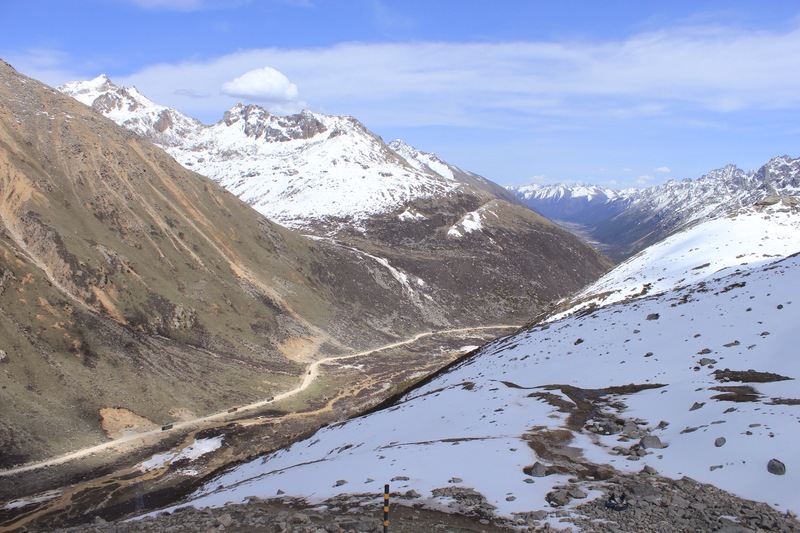 We then continue up through a beautiful valley – Spring is really in the air. Considering the height it’s really quite warm. 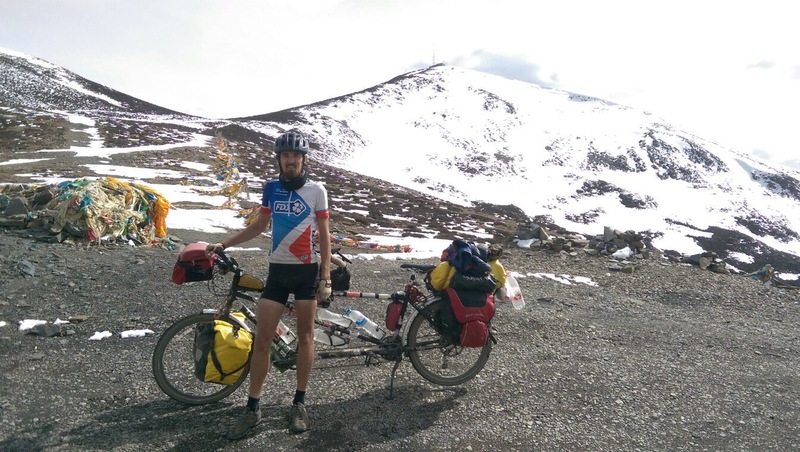 Paddy is still in his shorts and cycle top when we reach the summit. To put this in perspective, you could easily fit Ben Nevis (the tallest mountain in the UK) 3 times under us with plenty of room to spare. So back down we go towards Sangdui where we will stop for the evening. From far above Sangdui looks like the dullest, ugliest town we’ve ever seen but as we get closer we see that actually all the houses are incredible fortress like buildings, with beautiful turrets, gates and doorways. They are like mini castles – I guess you need houses like this to keep out the bitter weather up here. We find our own cosy haven and I sleep very soundly. We have a late start as we needed to fit new breakpads – all those hills have been tough on the ol’ disc break! 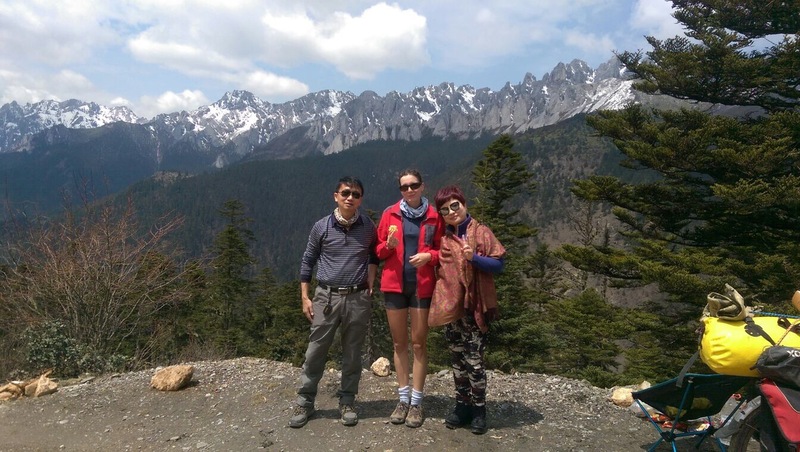 We get going and follow the Haizishan Rock Glacier up 45km to another high point. To our right are all the spherical rocks deposited by the glacier. 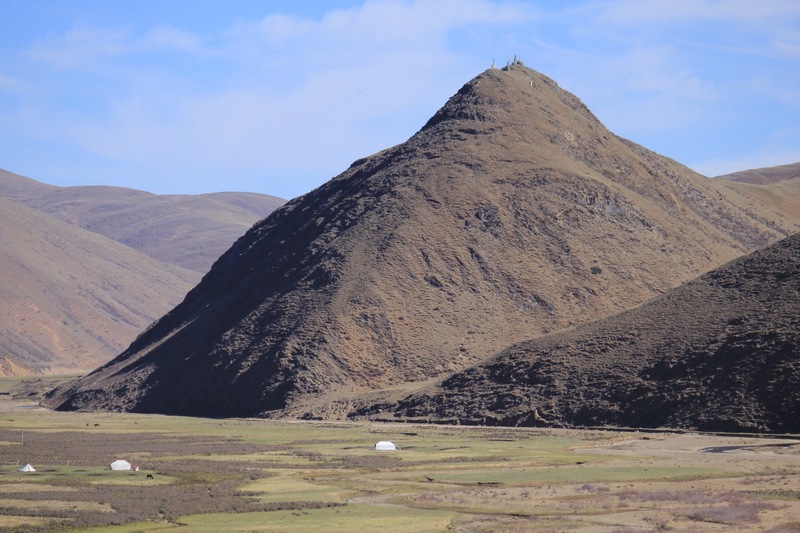 The high plateau at the top boasts a huge colony of four legged, sandy coloured mammals (the size of a small badger) but we have no idea what they are? They ran too fast for me to snap them on the camera. At the top it starts to snow! 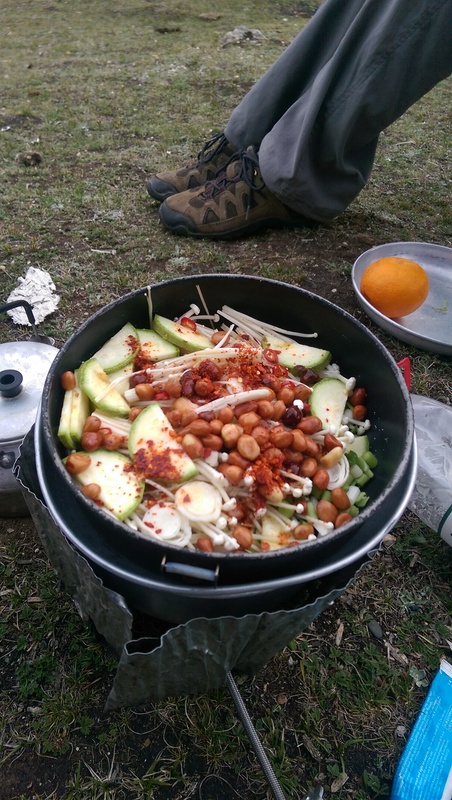 We drop back down and cook lunch before the last climb of the day. Here is Paddy dutifully collecting water. 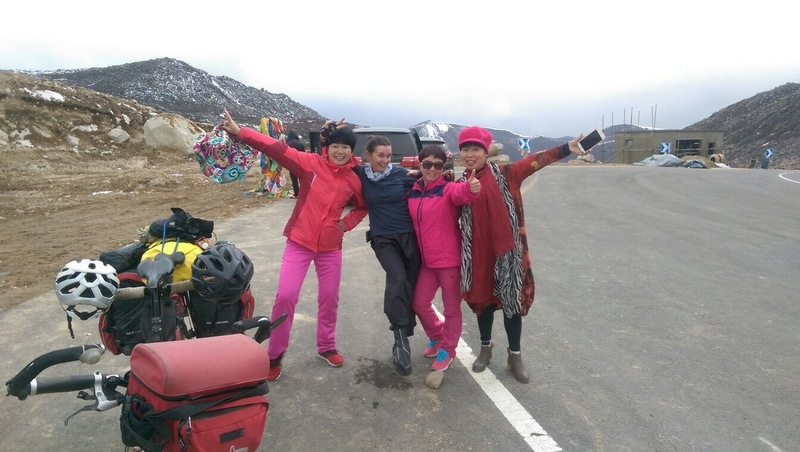 At the top of the last climb some Chinese ladies all in pink give us red bull and apples. 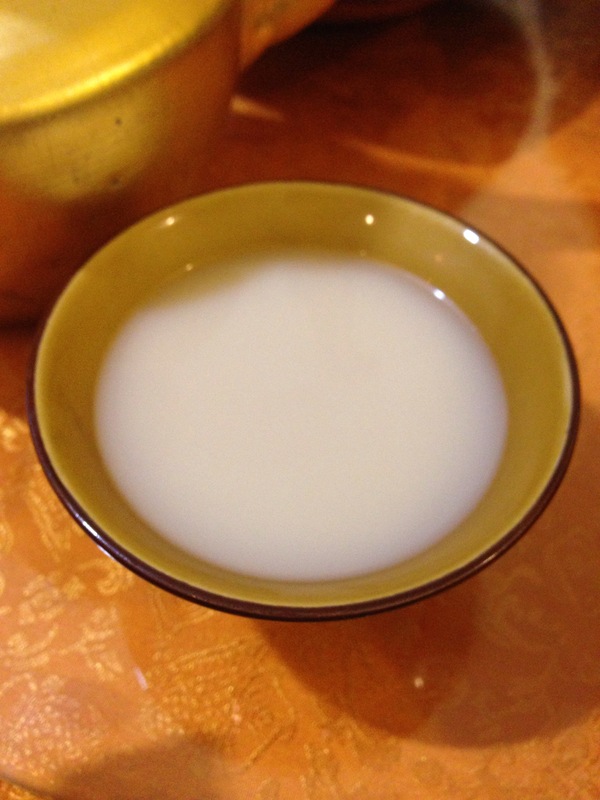 We also have a celebratory swig of rice wine. Then the long decent down – great incline through another spectacular glacial valley and at one point we reached 66km/ph (!) – through the protection of my down hood under my helmet I can hear Paddy’s intermittent, gleeful cries of ‘this is cool’ and ‘weeee’. Once we reached the bottom the road openes out to the most spectacular plain surrounded by mountains. 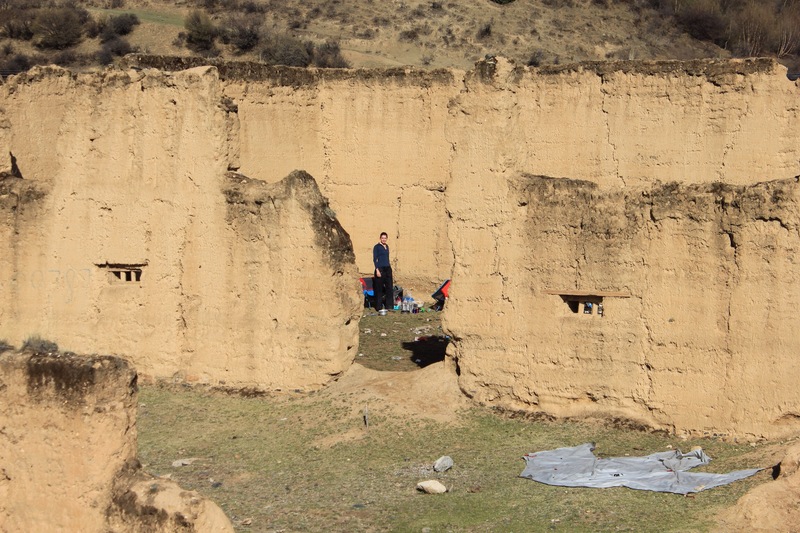 We pitch our tent in one of these ruins and build a huge fire to stay warm. It ended up being a very cool night and we woke to find icicles on the inside of our tent. Paddy had a bad night due to very sore cold tooth ache. It is the most beautiful morning, and once the sun gets going we soon warm up. The night before a teenage girl had turned up to give us some tinned food. One of the tins contained SPAM. This next picture is for you Katy Sheen. 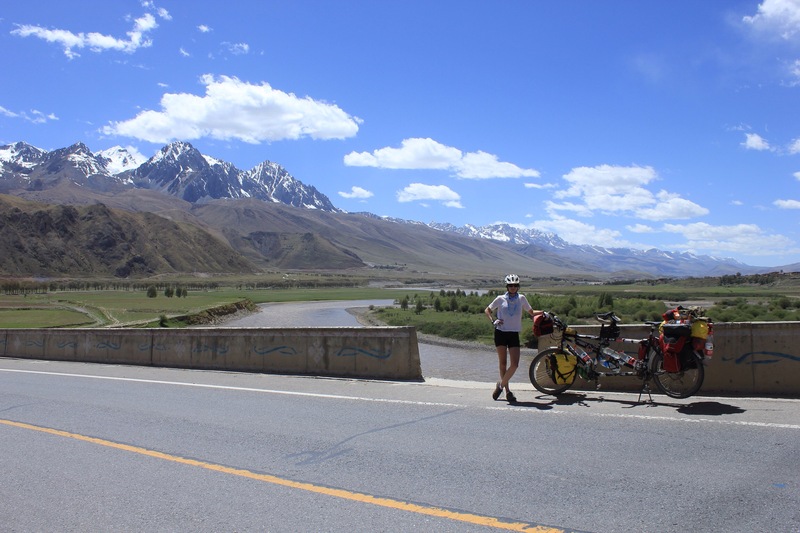 After a champion breakfast of potatos, scrambled egg and fried spam (the first time either of us had tried this) we cycle through some spectacular countryside and complete the 50k to Lijang by 2pm. Phew! Looking forward to a couple of rest days but it has been a great week of remote cycling! After our fiasco of a cycle the day before, we woke up in our cosy beds (complete with electric blankets) and took advantage of our empty dorm room to have a very long, well needed, lie in. We dragged ourselves out of bed to find brunch and then spent a lazy early afternoon cleaning the bike, doing our washing and generally having a sort out. 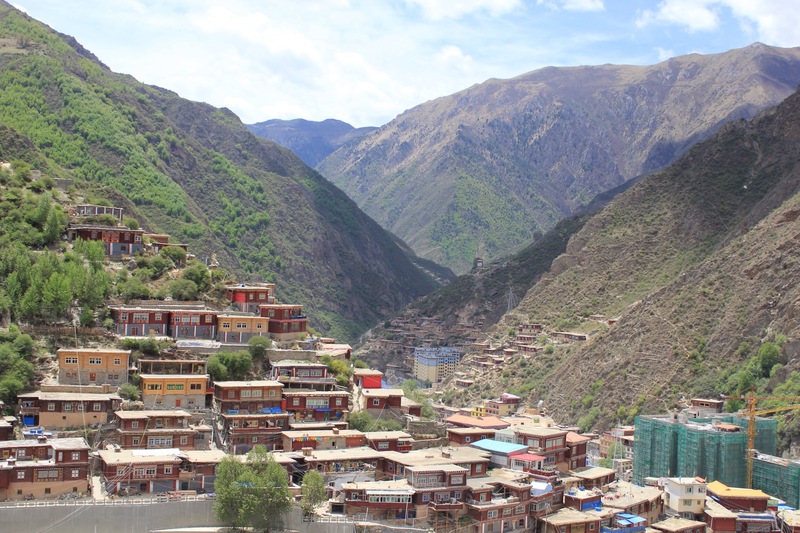 It was a beautiful sunny and crisp day – a bit like those early spring days you get back at home – so after we were done we headed out to explore Shangri-La and do some shopping. This is what I have to wear on washing day… Paddy laughs at me a lot on these days. 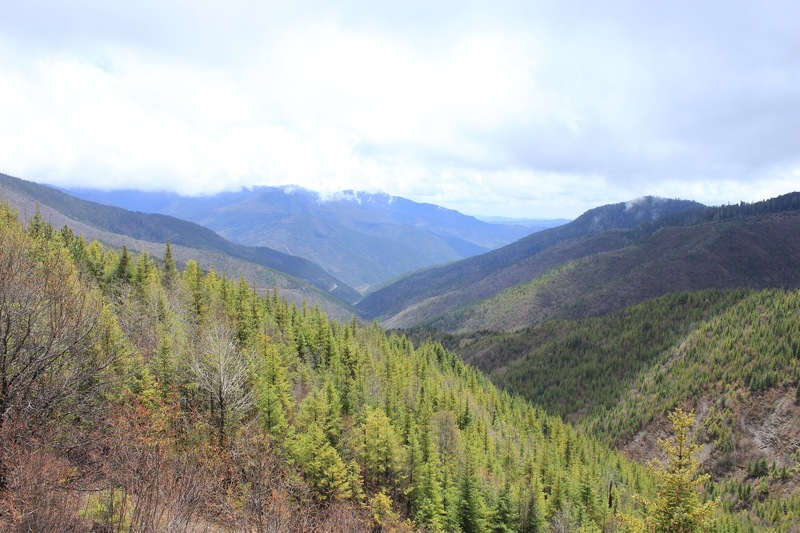 Shangri-la (formally known as Zhongdian) is the gateway to the truly Tibetan part of northern Yunnan. At an altitude of 3200m it was a good place to get acclimatised for the week ahead which will eventually see us climb to nearly 5000m! A devastating fire in 2014 burned a lot of the enchanting old town to cinders and there is still quite a bit of building work taking place but you get a sense it’s slowly recovering, although it’s nothing compared to Lijiang or Shaxi. It’s been getting colder and colder as we’ve climbed and I was in need of an extra jumper – here I am in my new fleece. 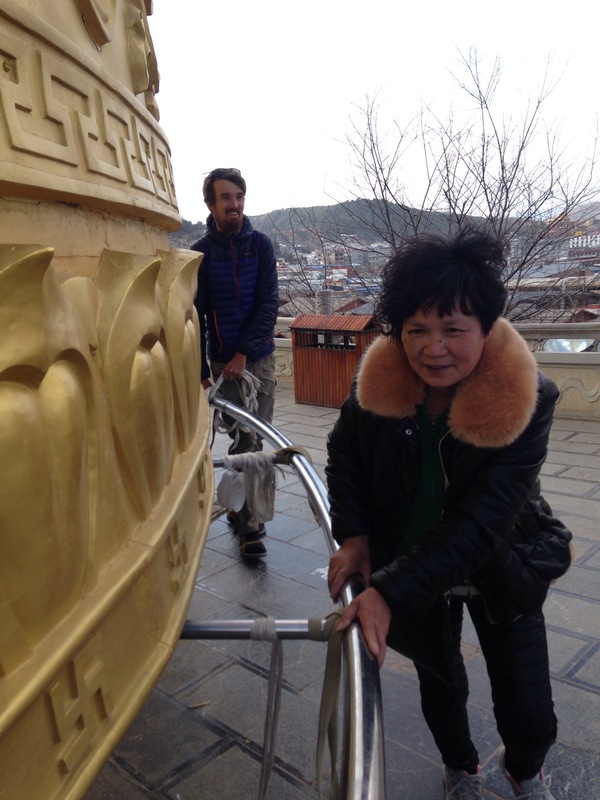 After a quick lunch we climb up to the main temple which boasts great views of the town and also has the worlds largest prayer wheel (it contains 100,000 smaller prayer wheels inside). It’s a beautiful object, covered in Tibetan writing which is very different from mandarin, related much more to the sanskrit languages. 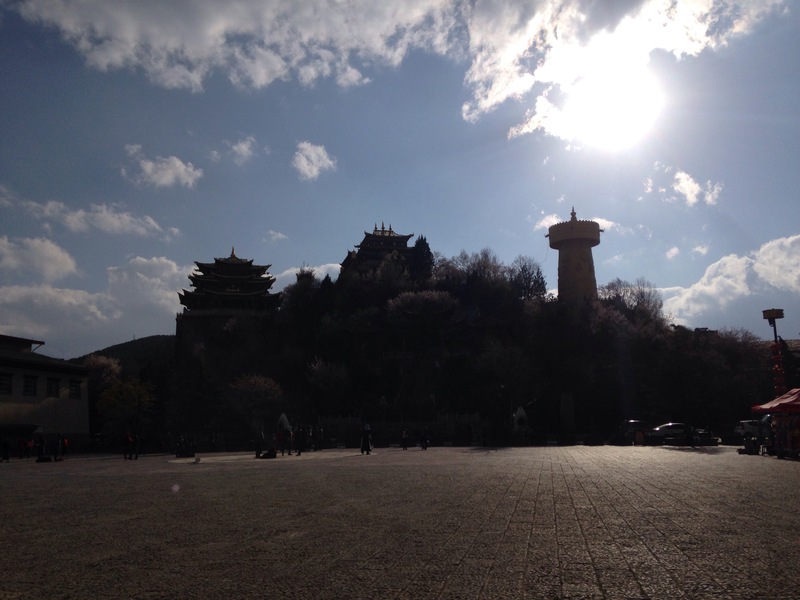 The temple overlooks a big square where people are milling about. 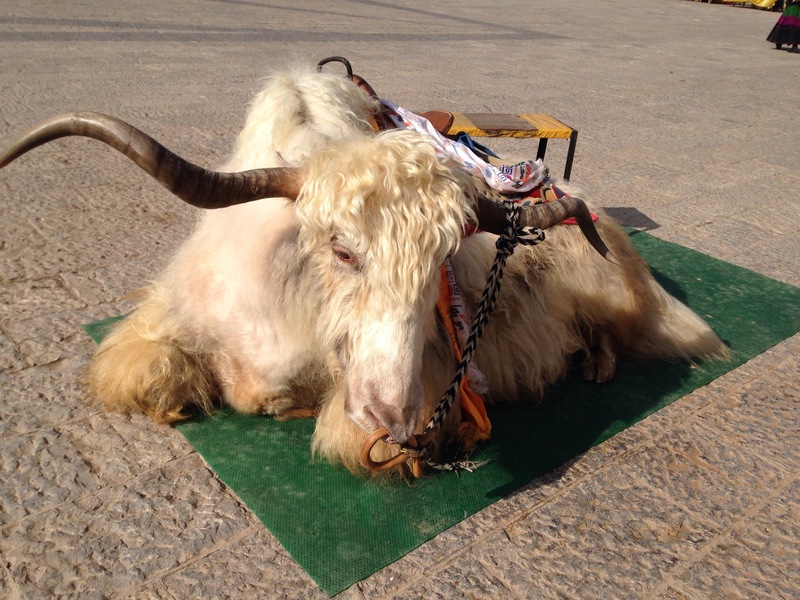 Here is a yak who was on show for tourists outside the museum which we had a look round. In the museum there is an interesting collection of medical documents and drawings, some of the treatments are very bizarre and, from what we could gather, tended to involve doing various things with different human fluids! Back in the hostel we pack up our stuff before heading back down to the square with the hostel owner, who tells us that the daily communal dance is about to take place. 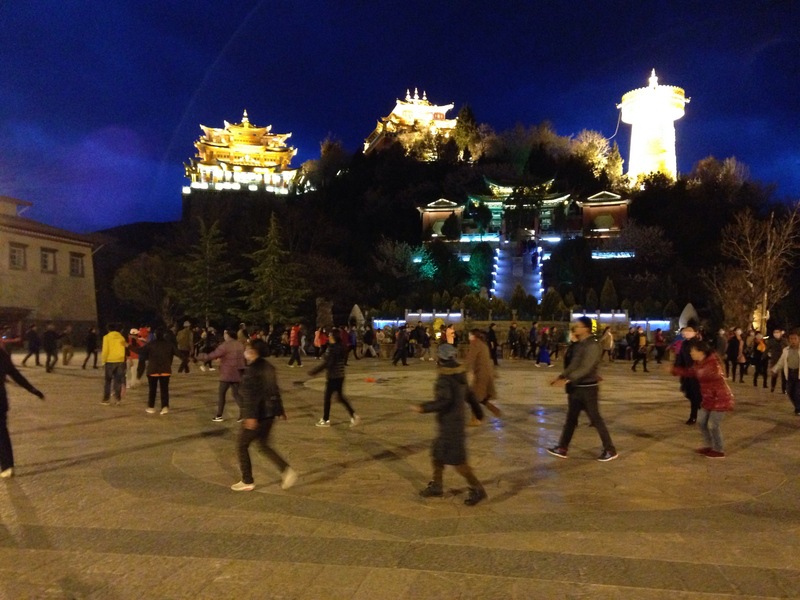 Everyday, from 7-9pm, between 100-150 local people will come down to the square to take part in a group Tibetan circle dance. A music track blasts out from the corner of the square and women, men, young and old form (generally) two large circles. They all know the dances and newcomers are welcome to take a turn at learning too. The dances are quite slow and, I guess, ‘courtly’ although Paddy and I struggled with the unusual offbeats and by the time you think you’ve got hold of a move they are on to the next one. The temple all lit up sets off the scene nicely and its a great communal atmosphere. Its amazing how many people have come down, presumably after work, to take part and keep this part of their culture alive rather than head straight to their homes to escape the biting cold. 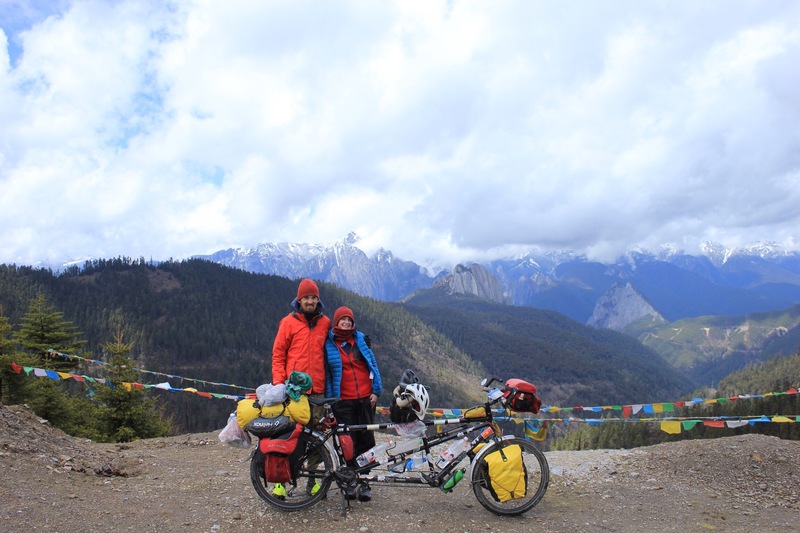 Onwards then to experience even more Tibetan culture – it will be a solid week of cycling to get to Litang over the border in Sichuan province.